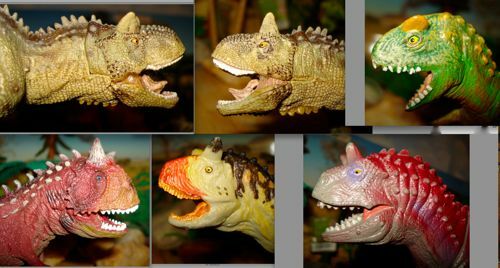 The Dinosaur Toys Collectors Guide blog is the ongoing chronicle of the Dinosaur Toys Story, using my own collection for illustration. 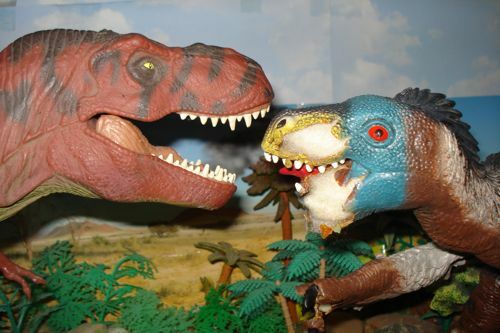 This is a picture-encyclopedia of Dinosaur toys since the mid-1940s. 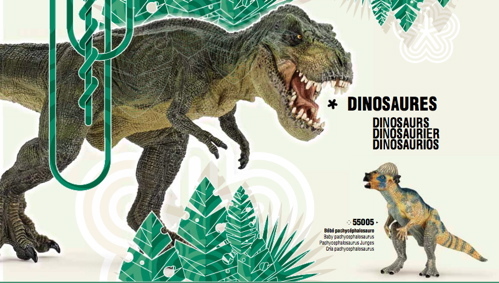 It will aid collectors in recognition and everyone in finding, recognizing and purchasing appropriate Dinosaur toys for themselves, their children and their friends. Just click on the "orange button" to painlessly subscribe. 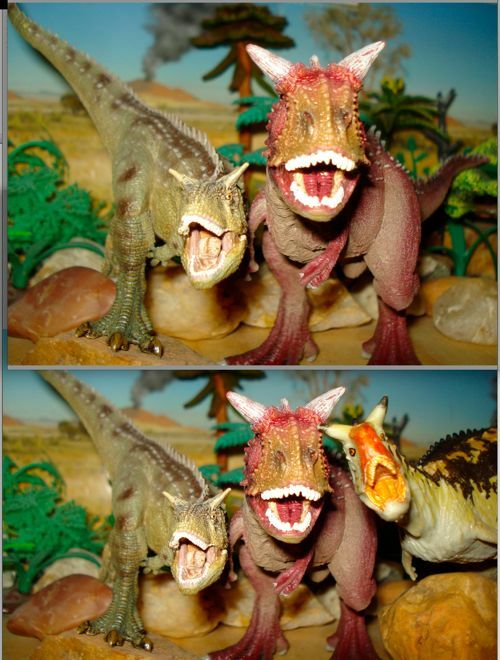 You can purchase Dinosaur Toys on Amazon buy-clicking the preceding link. 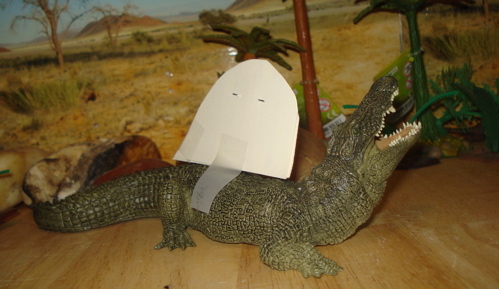 With the extinction of Dinosaurs there was plenty of room for new animals. 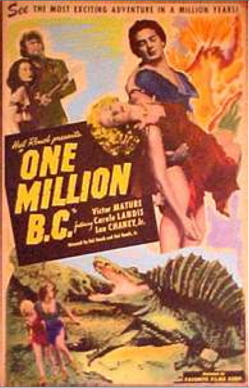 The extinction of Dinosaurs saw the rise of Mammals onto the stage. 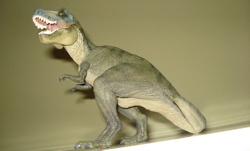 Continue reading "With the extinction of Dinosaurs there was plenty of room for new animals." 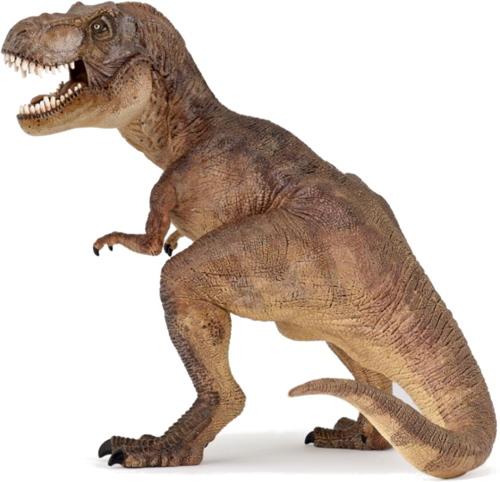 Tyrannosaurus Rex is the King of the Dinosaurs and the Dinosaur Toys. 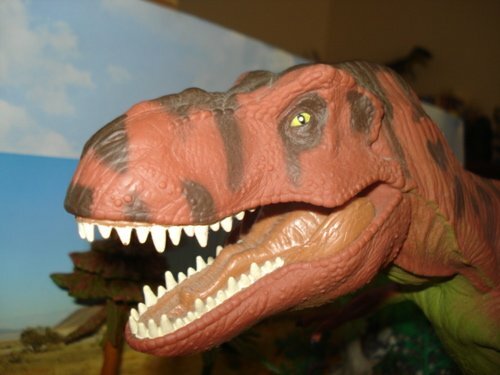 The Tyrannosaurus Rex is the King of Dinosaur toys. Get yours anytime, they're always hot. 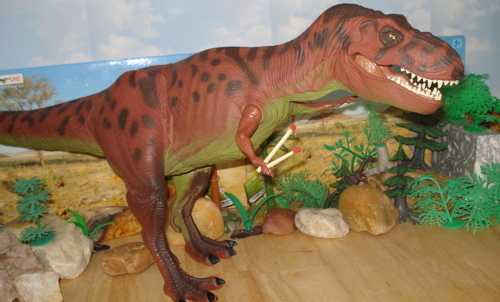 Continue reading "Tyrannosaurus Rex is the King of the Dinosaurs and the Dinosaur Toys." 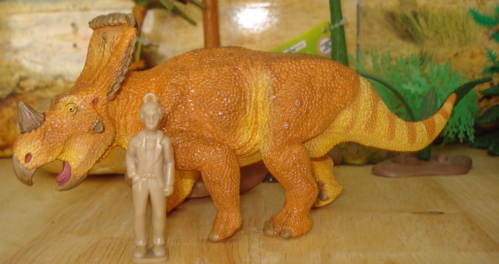 Continue reading "The Triceratops is One of the Big Three Dinosaur Toys"
Apatosaurus was Brontosaurus and are great Dinosaur toys. 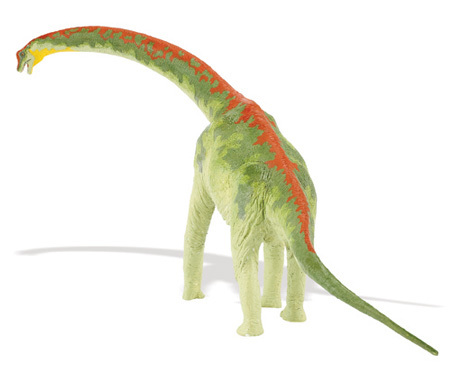 The Apatosaurus is one of the best known Dinosaurs and favorite Dinosaur Toys. 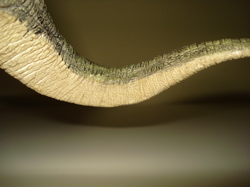 Continue reading "Apatosaurus was Brontosaurus and are great Dinosaur toys." As Christmas gets ever closer you can treat yourself and treat Rexford as well. Our site is supported entirely by donations from our generous viewers (you) and through our affiliate relationships. One of our most valuable and important affiliates is Amazon and so we are asking that you use the link below when you do your online shopping (especially/particularly your Dinosaur shopping) this Christmas season. 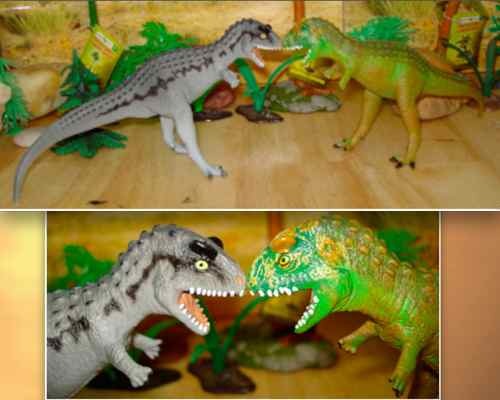 You can go directly to Amazon-Dinosaur Toys by clicking this link: All Things Dinosaur at Amazon. 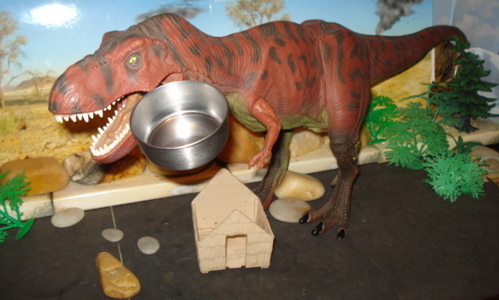 Poor Tyrannosaurus Rexford lives in a tiny shack, in an 'outback' somewhere, that's barely big enough for his foot. "And the shack just barely fits that." 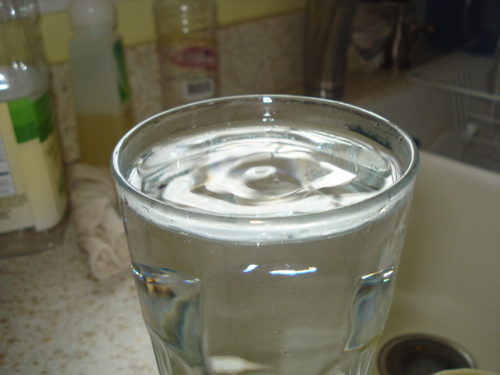 "Please help to fill up my cup. Thank you." 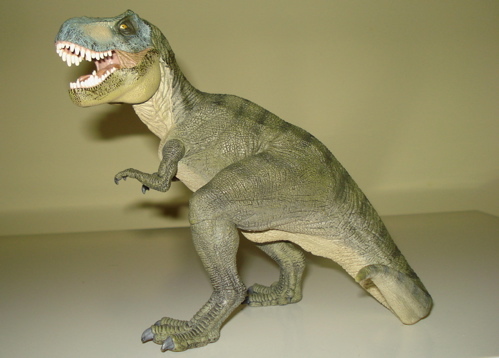 The Velociraptor has become one of the most popular Dinosaur toys. 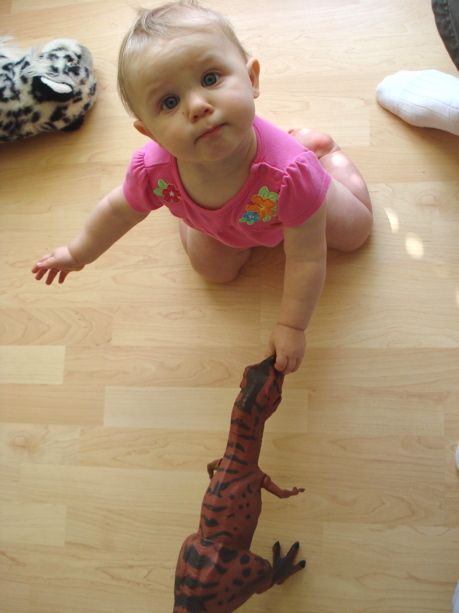 The Velociraptor may be the most versatile of the Dinosaur toys. 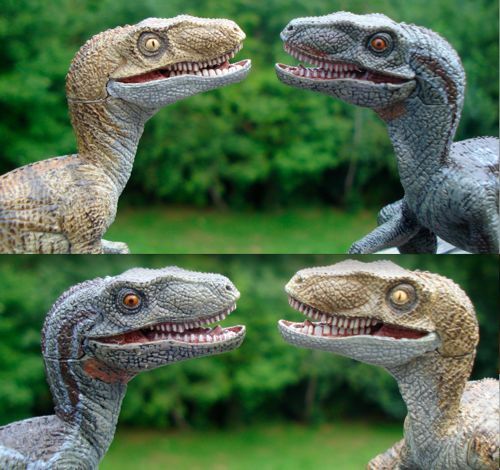 Continue reading "The Velociraptor has become one of the most popular Dinosaur toys." 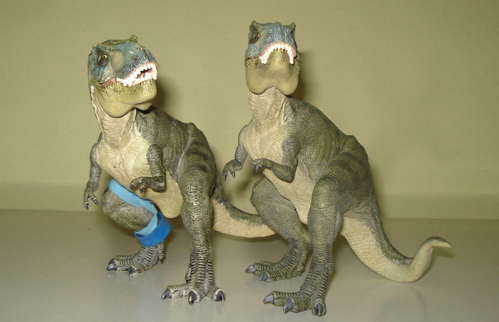 The Jurassic Park Dinosaurs are Among the Best Dinosaur Toys Produced. 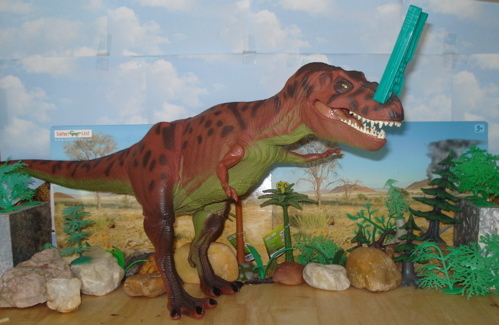 In 1993 the First Jurassic Park Dinosaurs Hit the Toy Stores with a Bang! 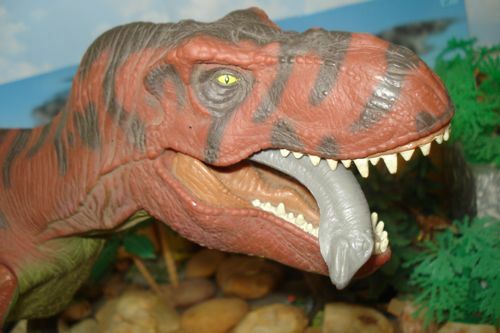 Continue reading "The Jurassic Park Dinosaurs are Among the Best Dinosaur Toys Produced." 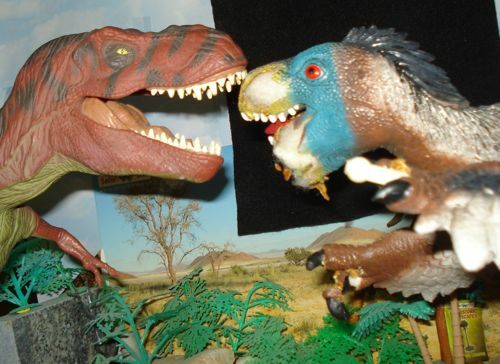 The Dinosaur Toys Blog Archive offers the "best" of the blog. 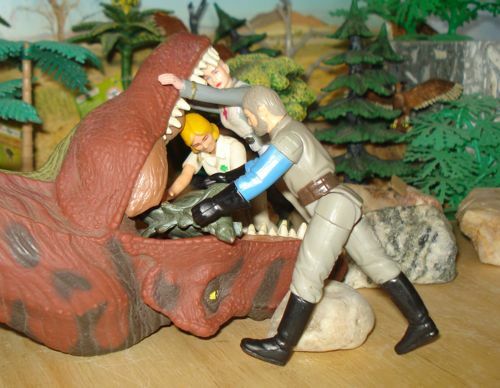 Continue reading "THE Dinosaur Toys Blog Archive." 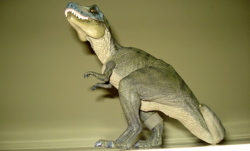 The Carnegie Dinosaurs Collection is Produced by Safari Ltd of Miami, Florida. 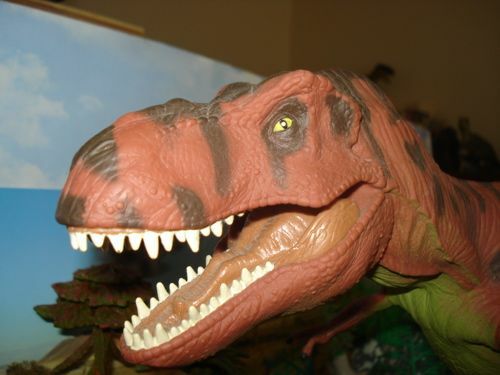 Continue reading "Carnegie Dinosaurs are the largest Dinosaur Toys collection." 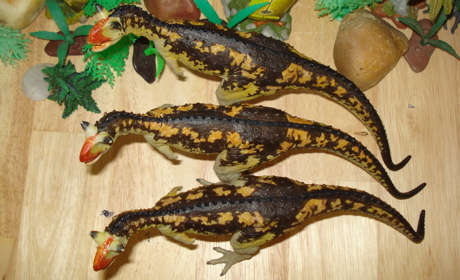 Battat Inc produced very collectible dinosaur toys. 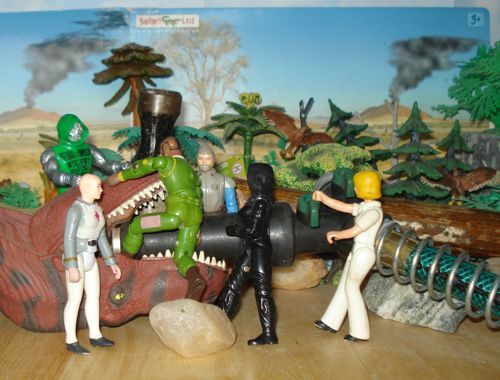 Continue reading "Battat Inc produced very collectible dinosaur toys." 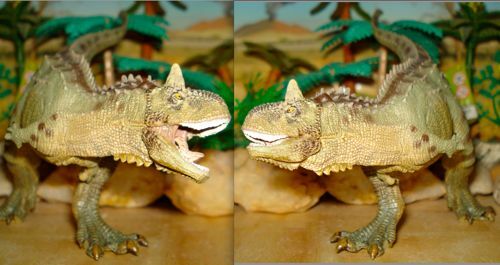 Ceratopsians Aren't Your Grandma's Frilly Dinosaur Toys. 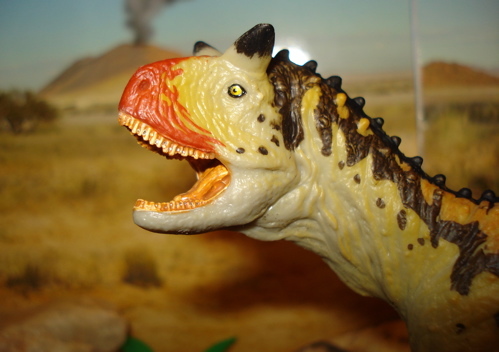 The Ceratopsians were Big Horned and Big Headed, not Frilled Doilies. 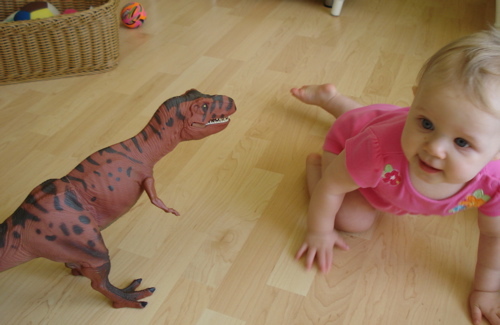 Continue reading "Ceratopsians Aren't Your Grandma's Frilly Dinosaur Toys." We are currently updating our site and trying to add income sources through the addition of links to All Things Dinosaur at Amazon. 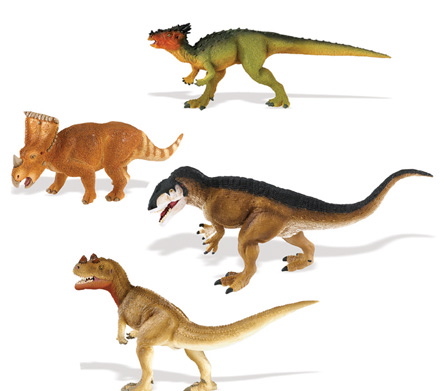 Each individual Dinosaur and Dinosaur Toy page will be updated with a direct link to Amazon so you can buy it immediately before thinking too much. Your kind purchase will help to support this site as it struggles to survive in a world it never made. Thank you in advance for saving us from extinction. This entry will appear regularly until this work has been completed. 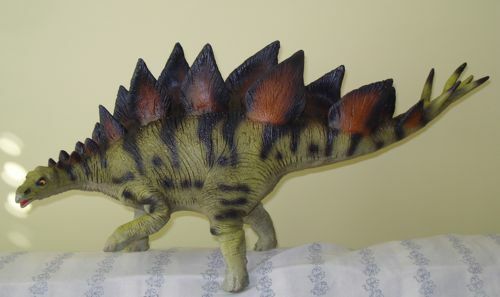 Ankylosaurus: a living fortress and a tough Dinosaur toy. 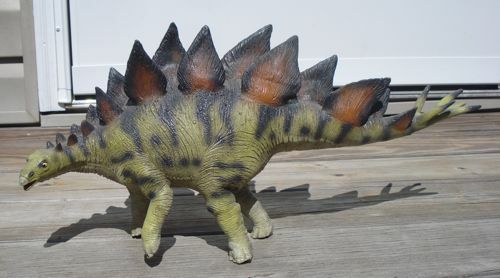 The Ankylosaurus dinosaur toys are a rich variety of replicas. 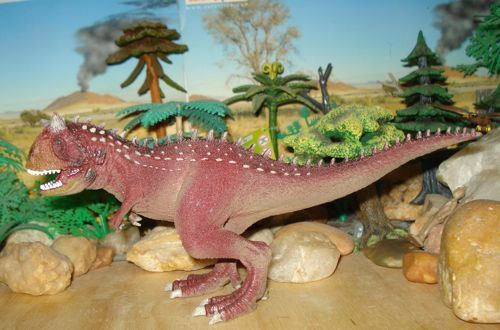 Continue reading "Ankylosaurus: a living fortress and a tough Dinosaur toy." 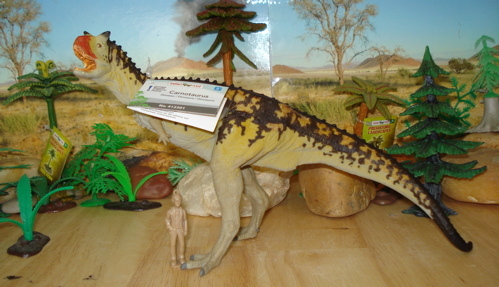 A Pack of Allosaurus For Your Dinosaur Toys Collection. 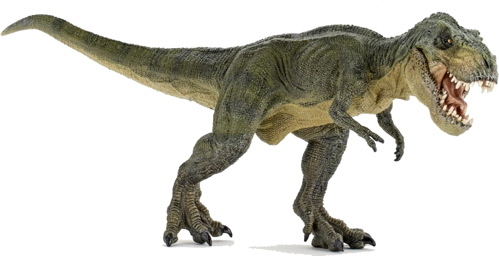 The Dinosaur Allosaurus is Known as "The Wolf of the Jurassic." 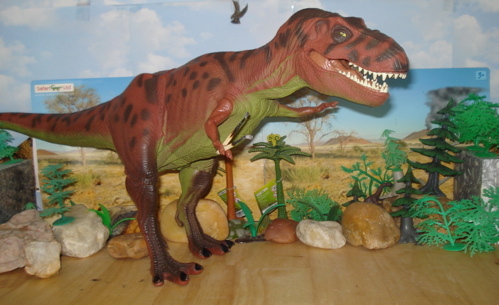 Continue reading "A Pack of Allosaurus For Your Dinosaur Toys Collection." 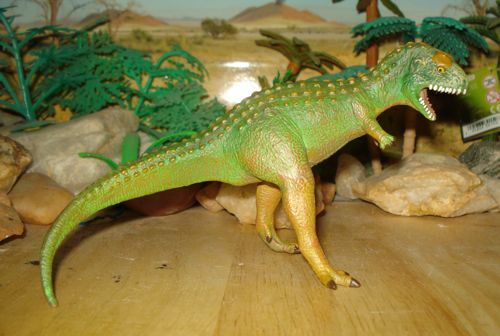 profiles are fine but Carnotaurus had a narrow skull and the Schleich figure's is excessively broad. as the largest belong to the structurally very husky Schleich model. More next time with personal commentary. 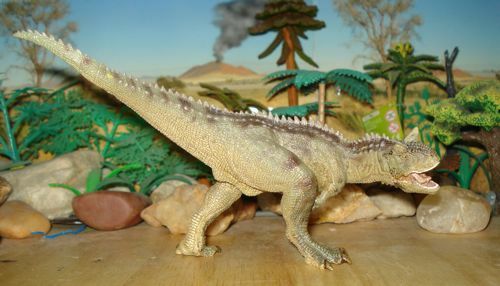 In 2010 The Carnegie Collection came out with what is close to the definitive Carnotaurus with the (above) foot-long figure. Beautiful colors, fabulous detail and a wonderful sturdy toy. Wow! This figure has terrific detail as well, if a rather derivative coloration, along with an openable mouth following Papo's earlier examples. and what some might consider the best of the lot, sporting the opening jaws, EXTREME detail and a beautiful reptilian color scheme. Its only flaw is the dramatic sculpt which (IMHO) doesn't lend itself very well to playability. Want a web business? Don't play around. Click here to learn more. 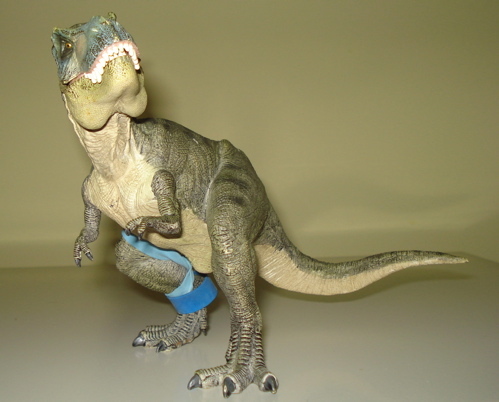 A 14" long limited production figure with the "dino-bite" loseable piece (the stupidest toy accessorization ever).... 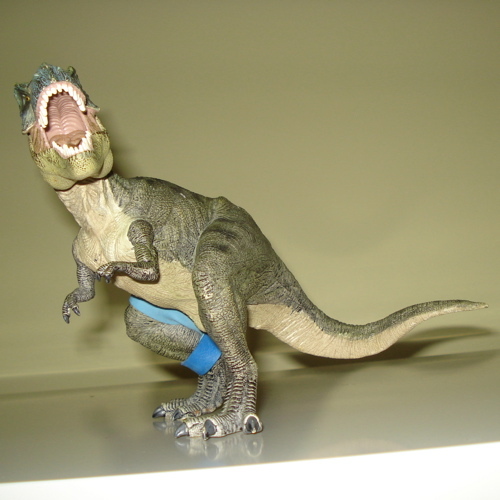 Followed shortly by The Dinosaur Studio/ Battat smaller version. 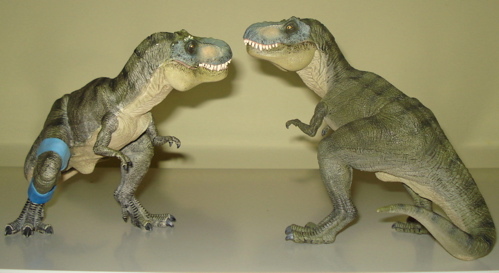 Both now iconic, rare and expensive versions of the South American Theropod. 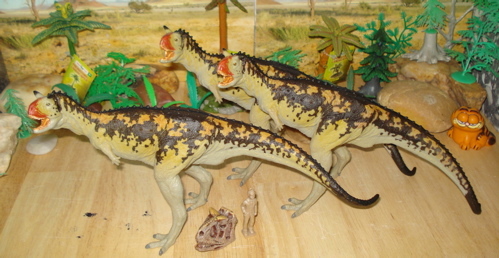 They also looked a lot alike with the same coloration and all. 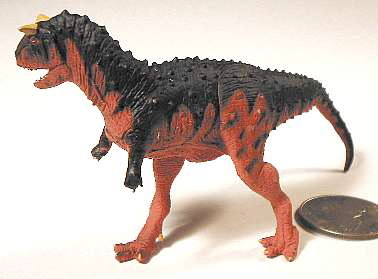 Next: the 21st Century Carnotaurus revival. 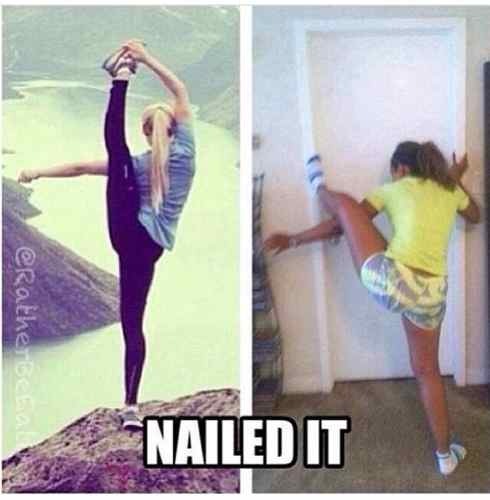 Because, dear Yogites, Yoga isn't a matter of achieving, it is a matter of doing. In the doing we achieve our goal. Experiencing ourselves, breathing and slowly, over time, easing into our practice and so our practice becomes perfection. So never become discouraged. Rather enjoy and experience everything you do and know that your practice is a road that always brings you closer to your goal. Continue reading "For All Rexford's YOGA Buddies"
Hey kids! 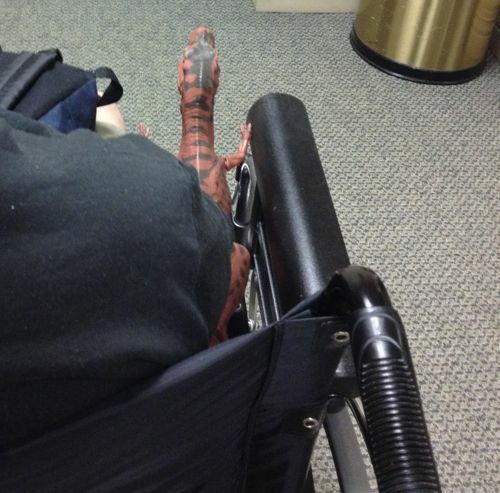 Ever wonder what happened to all those "terrible lizards"? Well, so does everybody else. Check THIS out. And after that, check THIS out too. 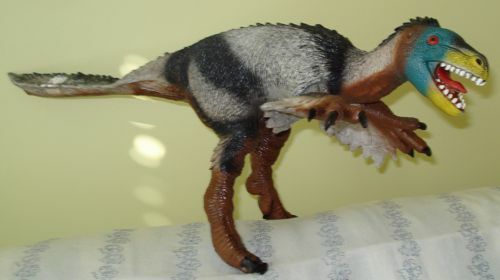 The Papo Velociraptor first came out in 2005 and was an immediate hit. 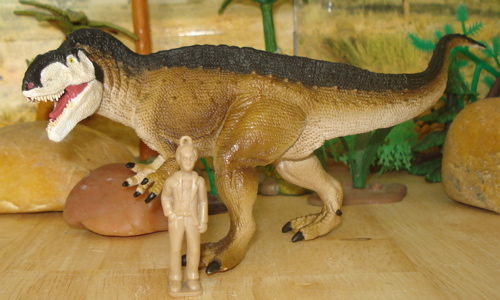 The first, light brown Raptor was superseded in 2010 by the darker grey/brown figure. 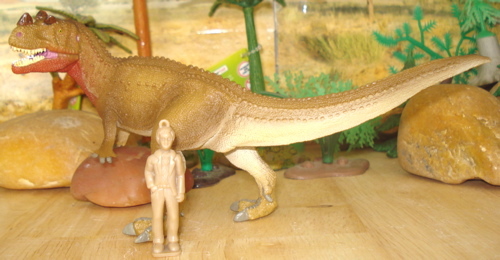 The figure is exactly the same, the only difference is the coloration. 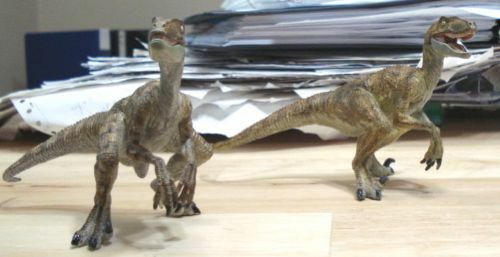 Continue reading "The Papo Raptor(s)"
The S-P Velociraptor started off fast as can be seen in the photos... all "before" thus far. Unfortunately after about a year deterioration set in. I had received an email from someone complaining about this but had not experienced it myself. And gets much, much worse. So I contacted Bullyland to ask for a replacement or redress. Their response was most disappointing. Summed-up and I quote, "Unfortunately we discontinued these items some time ago and really regret not having any better news for you...." And that is the sum total of their customer service. I am greatly disappointed in both the quality of their product(s) and especially in their customer service. By recent I mean in the past two years. The new additions have plastic skeletons and are poseable. This Steg is terrific and has stayed intact for over two years. I wish I could say the same for the Velociraptor. 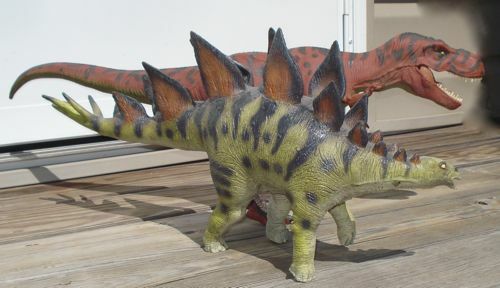 This Apatosaurus, Dimetrodon and Triceratops from the early production have served my grandchildren for four years with no problems, occasionally flying through the air like Pterosaurs. and go off to the playroom. More about these in the next blog. 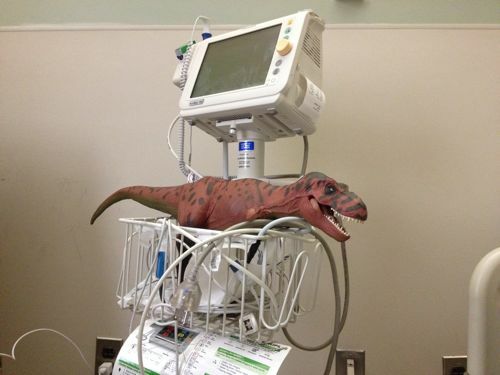 REXFORD has survived his "procedure," and has been sent to a recovery room where he awakens. Why am I waking up in a cage? 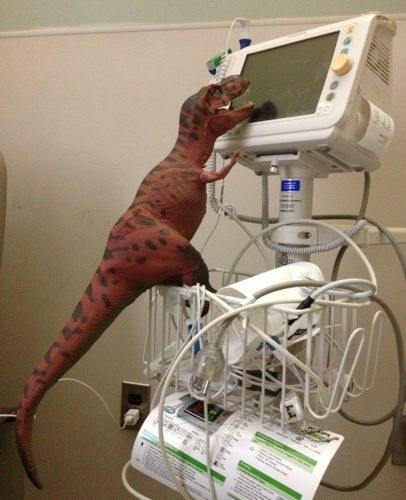 The first thing was to check on Rexford's vital signs. I'm okay Charlie. I'll be coming home soon. I didn't know you left. How about picking up a shrimp and field-mouse large pizza on the way home? … and discovered that they hadn't been. Next on the list of things to do is to see if Rexford can swallow. After all, that was the presenting problem. 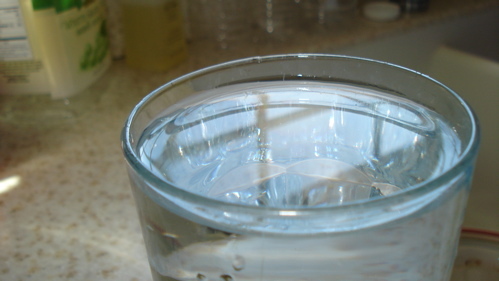 We start with simple liquids. Oh no! Now I've gone blind! Everything's gotten dark. Will my troubles never cease? Yes. 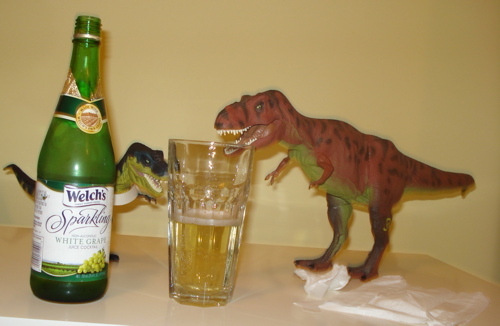 Rexford has a drinking problem. Luckily this one has a simple fix and our "hero" was ready to try slightly more solid food. This is the best stuff I've ever eaten…. Then he stripped a popsicle down to its roots…. And only the bones remain. This is very dry and sorta tasteless. Now he is ready to explore his surroundings. First of all, the television. How do ya turn this thing on. 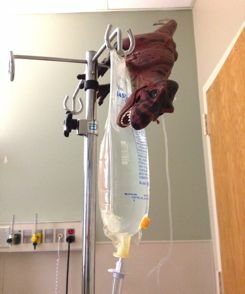 I wanna watch Jurassic Park. Then he discovered a tree in the room. Nice view from up here. Oh, did you ever swing on a star…. Where's that nurse's call button? 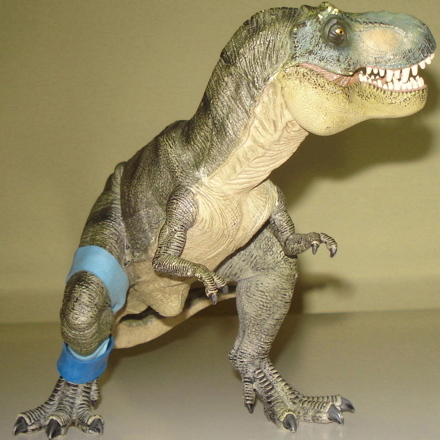 Well Rexford seems to have made a complete recovery and a poor impression and so he is ready to go home. But he does have to go through with the humiliatin' hospital protocol "perp ride"…. And of course our thanks to everyone involved…. 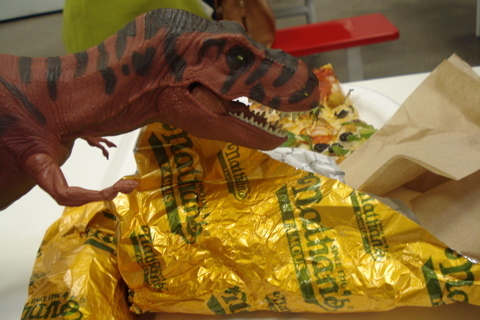 And upon arriving home Rexford had a bite to eat…. Will somebody pleeeease get me outta here? 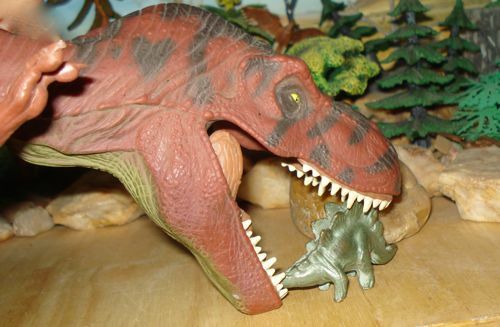 Rexford Dinosaur tried to swallow a snack that didn't want to be. 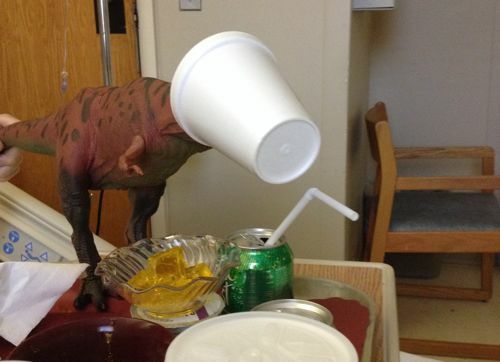 An esophageal donnybrook ensued leaving Rexford semi-conscious and at the hospital where his extinction is to be once again postponed. Hopefully. 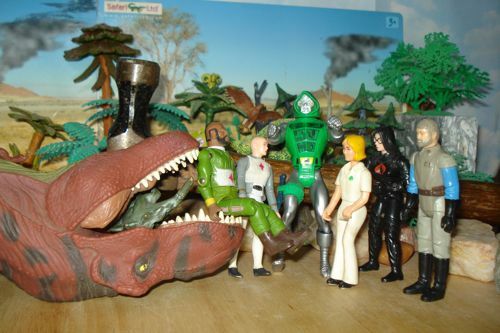 His medical team consults some more. Dr D: He'll need lots of anesthetic. Got it right here. Dr T: Let's make it fast. I have a tee-time in thirty minutes. Ilia: OOOhhh, l LOVE Peppermint Tea! Madine: I heard he's famous. Dr T: So, where's the patient? An "endoscopy" is called for. They carefully place a tube with a tiny TV camera down the patient's throat to see the obstruction, then push it out of the way, down into the stomach. A relatively simple procedure… usually. Dr T: OK everybody, careful and delicate placement is called for. Dr D: So is anesthetic! Ilia: He's got awfully big teeth. Dr T: They can be removed if necessary. Dr T & Dr D: More Anesthetic!! Dr T: There's something in the way! Madine: That's why we're here! Baroness: What a revoltin' turn of events. ER Nurse: Don't give up, doctor. Your patient needs you. Dr T: There, just one more shove. Dr T: More anesthetic, Dr D.
Dr D: Right on Dr. T.
Dr T: This too, shall pass. Dr T: Turn on the pressure. Dr D: How about some more anesthetic? And so it goes. The endoscopy is a success . 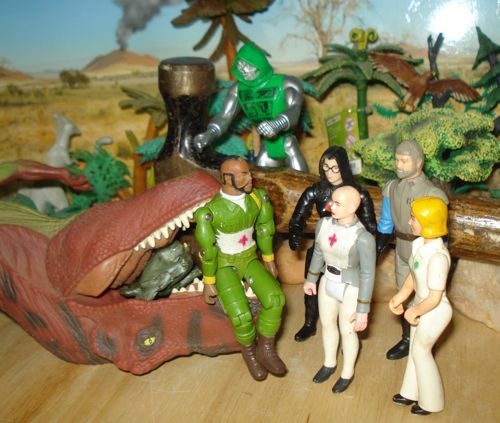 Rexford is saved. Baroness: What a cute little hors d'oeuvre kinda fella. Ilia: And he comes with his own plates and toothpicks. 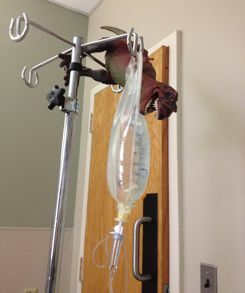 ER Nurse: No wonder Rexford couldn't resist. Dr T: Better check him out for tooth marks. Dr D: He'll need anesthetic. 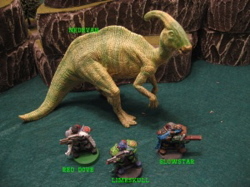 SRG Stegosaurus: I think I'll pass. Bye bye and thanks for getting me outta there. ER Nurse: He too, did pass. Next up. Recovery, of a sort. But actual ingestion proved a problem. ER Nurse: It's stuck in there pretty good. Nurse Ilia: I look pretty good myself. Nurse Madine came in to help. 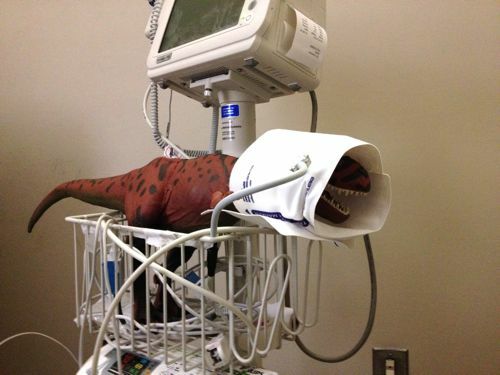 ER Nurse: This looks serious. Nurse Ilia; How good do I look? ER Nurse: Excuse me, we have a patient here. Nurses M&I: Oh? Really? Where? Nurse M: PULLLLL!!! Uh, oh. We're gonna need professional help. So they called in the "operating team". "Dr T" is in charge, Dr. "D"(oom) is the anesthetist. And his case was fully, carefully and professionally diagnosed. Dr T: That's MISTER Dr. "T" to you. Nurse Ilia: He ate something that doesn't want to be. Dr D: He'll need anesthetic… LOTS of anesthetic. Dr T: I pity the patient. Baroness: This patient is making me hungry. Nurse Madine: Let's all have lunch afterward. Dr T: So. Where's the patient, anyway? 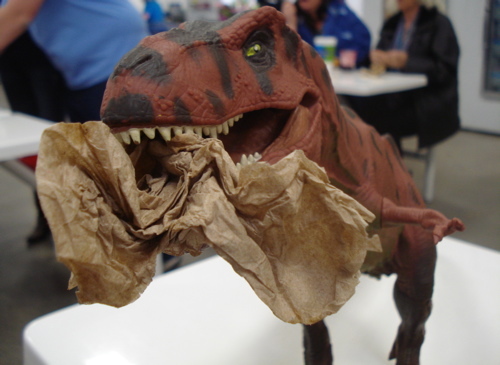 What will happen to Mr Rexford? Will He survive his snack? His medical care? Stay Tuned. 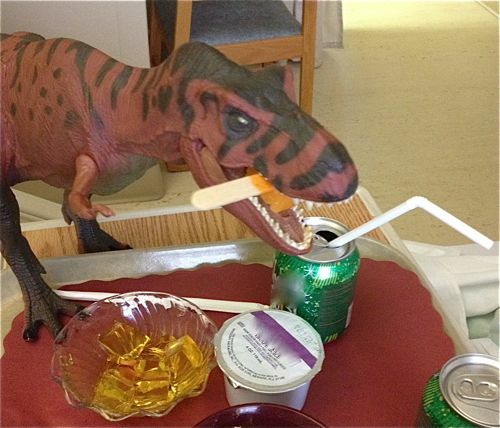 "Is REXFORD getting the best care? He's certainly getting the best available care. Are you getting the best web-services? You can get the very best website from the very best service provider. Check this out: and you'll be getting the best in servers and service for your new and profitable website. 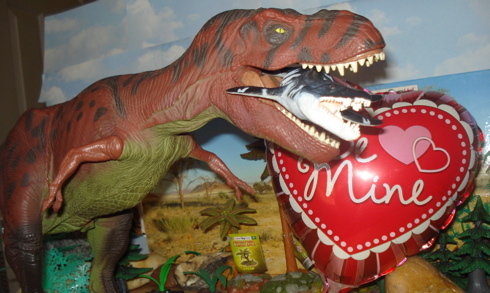 As part of what Rexford and I are doing here we get submissions from "fans." Some are interesting. Some are presentable. This one is both. 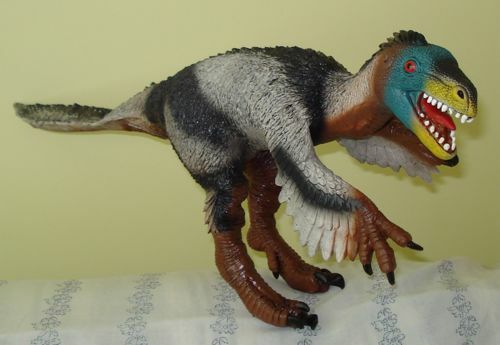 It concerns some apparently quite rare figures sold for a short time at the AMNH (American Museum of Natural History in New York) gift shoppe and was submitted by our friend, Fred. Enjoy. Fred has good taste. Whether he tastes good is still to be determined. 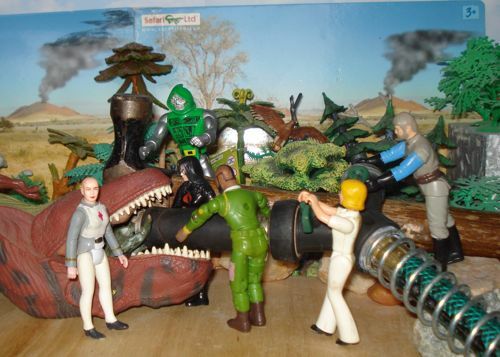 "About 2 years ago while visiting a friend, he brought out a Brontosaurus model he had come across in storage. He is in his early 50s & when he was around 10, he went to the AMNH for the museum's centennial (1969/70). He bought it himself & had kept it since then. I was quite taken. It resembled both the Sinclair & later DFC re-issues but I had never seen them in this coppery/bronze marbled/swirled color. I contacted several people & got a combination of "I don't know" & "they are DFCs from the 80s". But my friend was absolutely sure where and when he had gotten his AND that it was not in the early 80s. 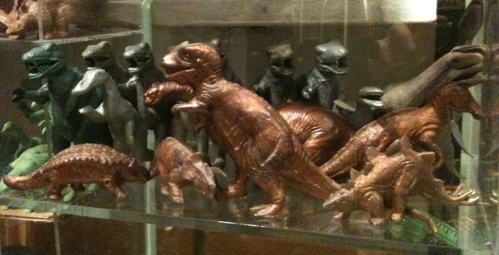 About a year went by & one day I same across a 'lot' of Marx Dinosaurs on Ebay w/some very familiar bronze dinos! I contacted the seller. He was from Pa & he told the exact same story. I won them & they were just like my friend's dino. 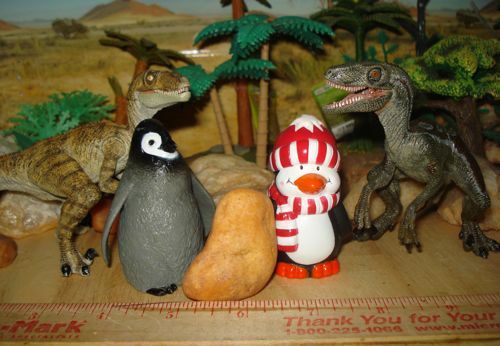 I have only seen 5 others since then- a Bronto & Rex , an Anky & the last 2 (that I won in an MPC cereal dinos lot)[!?! -ed]. 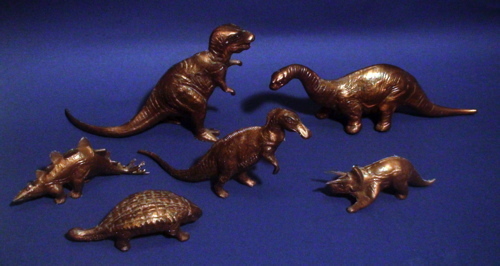 My hypothesis is this: in the 40s/50s the AMNH had sold SRG 'bronze-like' metal figures and then in the late 70s/80s they sold the monochromatic Invicta plastic figures. I think these figures were a transitional concession of sorts. Made of cheaper/lighter/more durable(?) plastic but colored in a way to make them appear (at least to the casual observer) bronze- like their metal predecessors. I am of the opinion that they are vary rare- that they were produced for the museum's gift shop from late 1969 until the early 70s when the first Invictas came out. " Here is an interesting tid-bit of a "news" item,"Dinosaur Gas Emissions May Have Warmed Air," but what we are really interested in is Rexford's reaction. Ugh! It stinks around here. 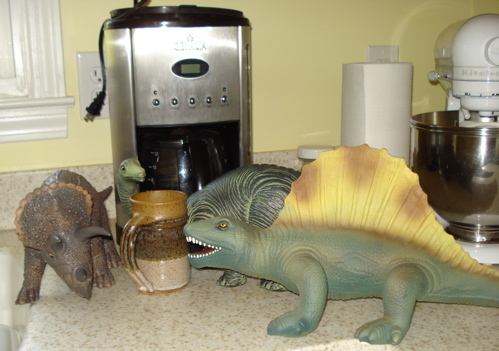 Those danged Sauropods are at it again. 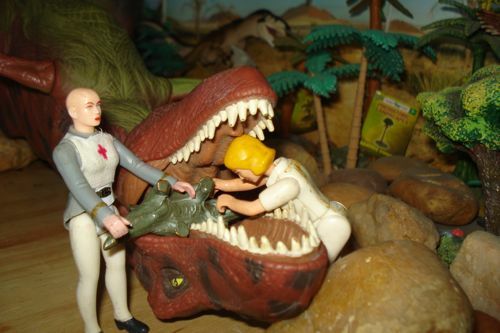 There's gotta be something a non-violent T-Rex can do. It is an ill wind that blows no good. That giant clothespin can't be comfortable. These should solve my problem. They're safety matches too. 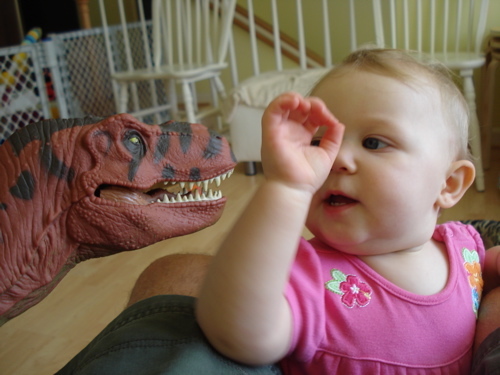 Rexford is really quite careful, for a Dinosaur. 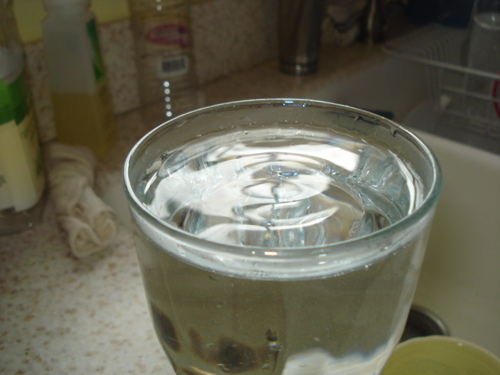 Is the solution to 'global warming' as simple as this? Two matches and the will to use them? Ugh!! It still stinks around here. I guess the answer is more complex than first thought. This is my last match. 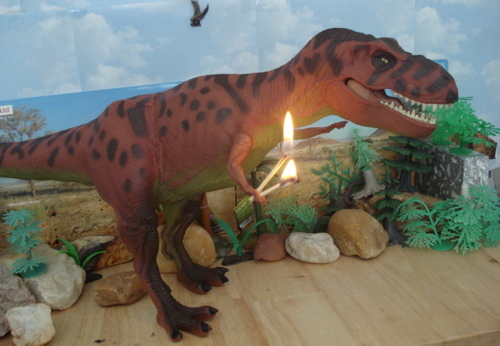 I'm gonna light up the barbecue and it's gonna be Sauropod burgers. You're all invited. Well, so much for peaceful solutions. In this case an ill wind led to a fine meal. The proof for "global warming" comes up a bit short (and occasionally delves in the absurd) but if you want proof of who provides the best web business support check THIS out. Trips to "big box" stores don't come that often and always involve lots of shopping so Rexford prepared by having a coffee out in the parking lot. My arms are too short to hold the cup so I have to use a straw. A "gas" barbecue? Perfect! I've already got gas. PeeEwww! Too much information. Rexford is also full of nutritional advice. Sugar is a lot like snow, but much sweeter. No one can say that Rexford is lazy. 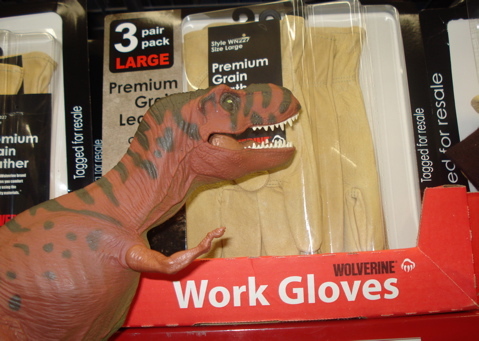 Today he's on the look-out for work... gloves. Three pair? I'll wear these out in no time. Must check the fit. Is this right? How the heck can I work in these? What kind of work is this? 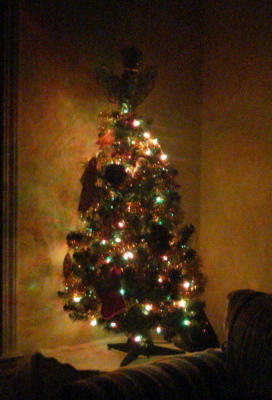 Lights! Lights! After this rather traumatic work-related incident Rexford found himself in need of some R&R. This is more like it. This would make for a great job. 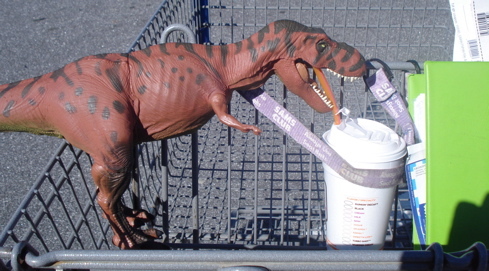 While Rexford swung his staff finished shopping. On to the check-out. 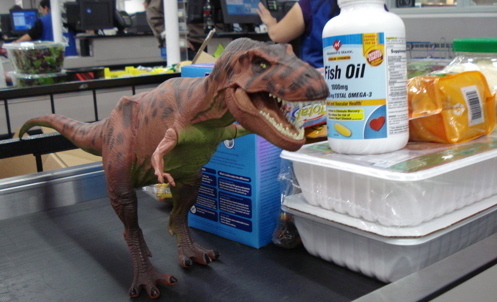 Fish Oil?? Where the heck is the rest of the fish?. After the purchase we all sat down for something to eat. 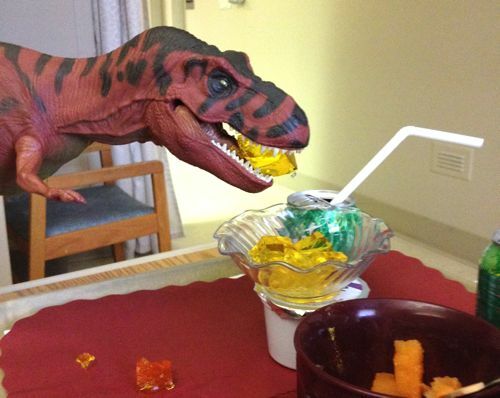 Rexford expected his food to be more natural in appearance. Mmmmmmmm!!! 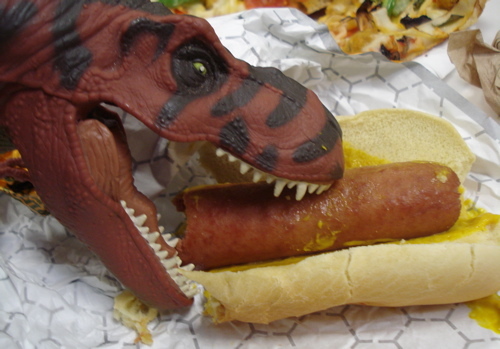 Hotdogosaurus always hits the spot. Ole Rexford has excellent table manners too. See. 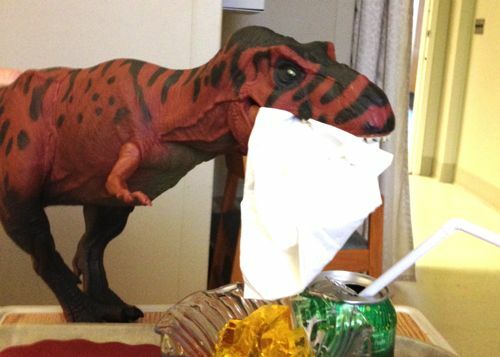 I can eat a napkin just like anyone else. Stop staring! Oh, stop showing off. And so ended our latest shopping trip. 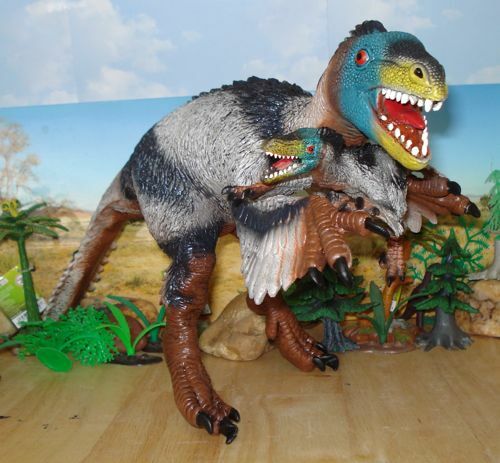 Since 2006 Safari Ltd has been updating and expanding their Wild Safari Dinosaurs lineup spectacularly. They recently sent me some samples of the newest members of the family and Rexford wants to share them with you before I do the more labor intensive profile pages. As noted, this has been out of production for years and 'we' have been waiting. 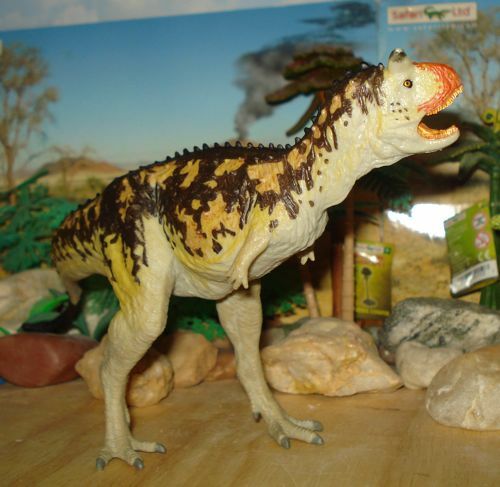 It is time for us, the 99% to get what SafariLtd, the 1% have- a New Ceratosaurus for 2012!! Come. Please. Occupy my mouth. I did say please. 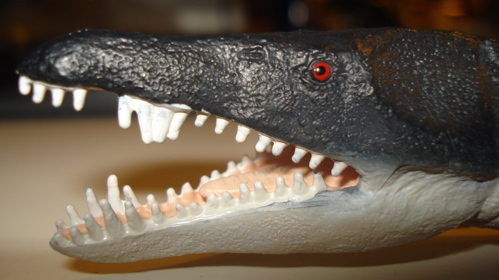 What is really cool is that the teeth aren't a uniform white but, rather, are somewhat discolored, as after a recent meal. 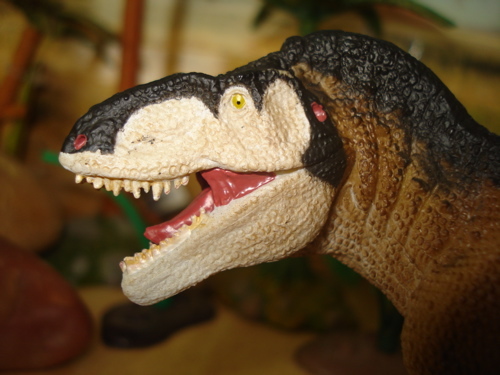 The Ceratosaurus roamed the late Jurassic and was a smaller contemporary of the Allosaurus. 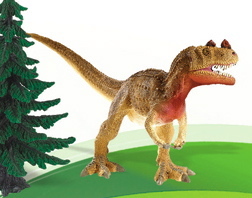 The next figure is Dracorex, a member of the head-butting Pachycephalosaur clan from the late Cretaceous. It was only first discovered in 2004. Seen here (below) with "Me." 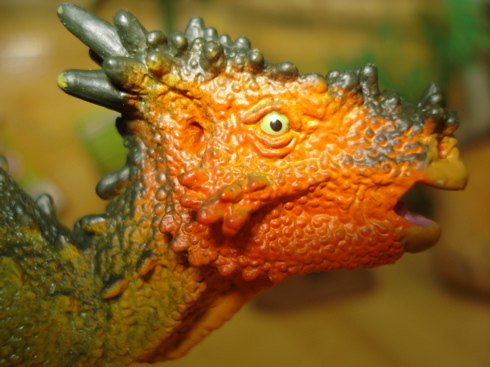 The Dracorex was a vegetarian and had a thick, hard skull with bumps and lumps and horns all over it. It is believed that it used its head like contemporary mountain goats, et al, battling for prime territory and mating privileges by butting heads. Not tonight, dear. I have a headache. 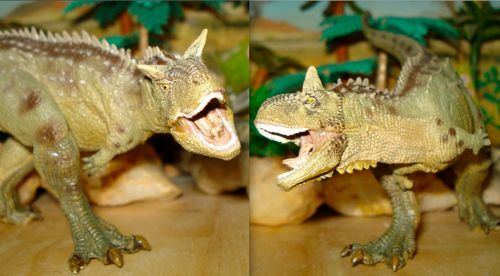 Moving right along, you might even say wandering we come to the Vagaceratops, or "Wandering Hornhead" who was 'frilled' to be discovered barely a decade ago. 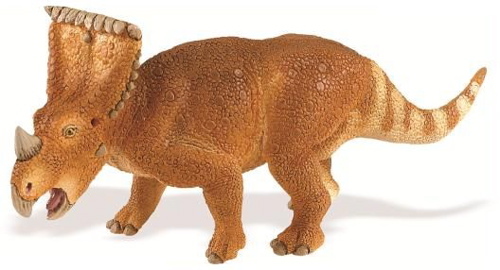 (Not to be confused with the "Vegaseratops" that went extinct as the result of gambling losses betting on Dreidels.) 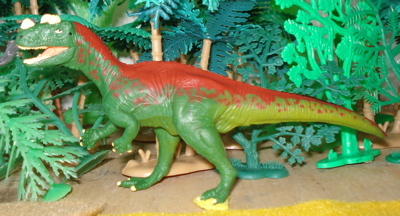 He lived in the late Cretaceous and has been reborn for the 21st Century. 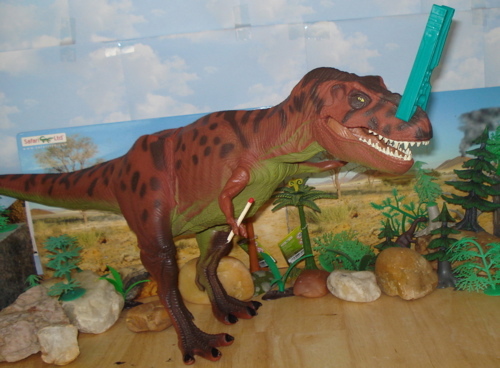 Another example of Safari's being on the cutting edge of novelty and quality in the Dinosaur Toys World. With 'old yeller' back there extinct, the frill was gone. Your wandering friend has returned and the frill is back. I had thought that 'white-face' would make you look like a clown. Don't mess with me, tasty one. If you want to find the best of the web-business services you can do so here. 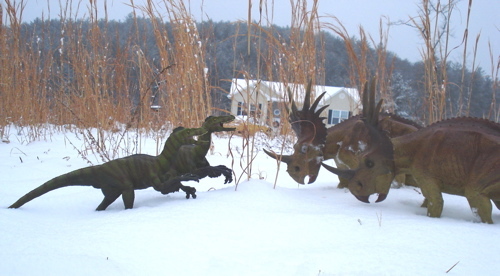 It certainly looks as if this Winter has reached a relatively ignominious conclusion temperature-wise here in Dinotown. 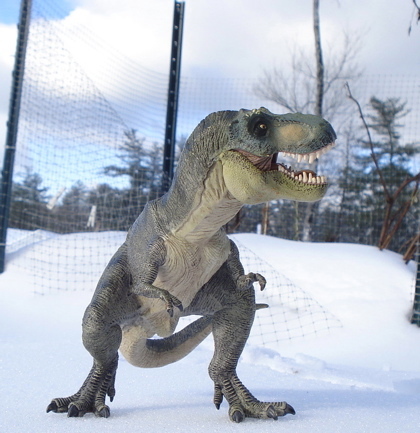 An absolute nullity of snow, combined with well above average temperatures and the onset of "daylight savings time" have all conspired to make our snow-loving Dinosaurs want to bite something. Maybe you. 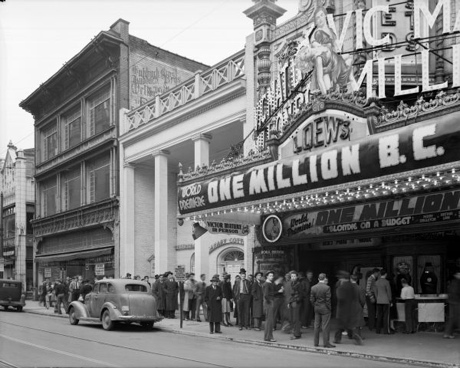 So we are taking a nostalgic sojourn down memory-lane to take a look at Winter-past.... The opening line is from Francois Villon, a 15th Century French Poet and roughly translates to: "Where are the snows of yesteryear." At least that's how Rexford translates it. 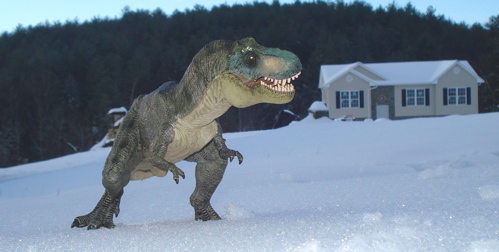 Tyrannosaurs rule whatever the conditions, that's for sure. Guess I'll check out the food locker over there. 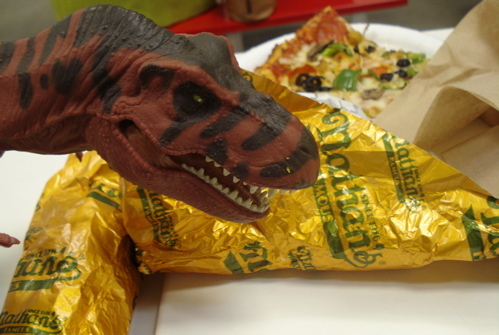 The smaller Theropods find hunting difficult and also seek richer hunting grounds. Sniff. Sniff. Aww shucks. Let's go home. The one that smells tastiest. 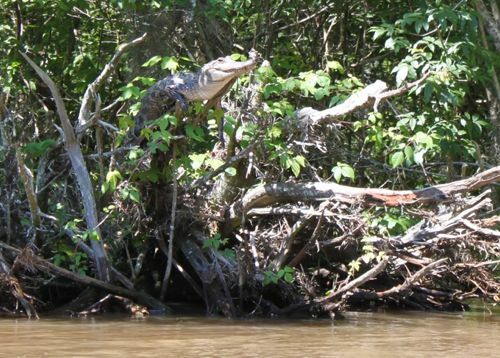 Others, that rely primarily on fishing have an even more difficult time. The ponds and lakes are frozen over. I may have to resort to carnivorism. No. Wait. There's a 21st century fish store. This isn't exactly what I was hoping for. Meanwhile others are also out searching for food. 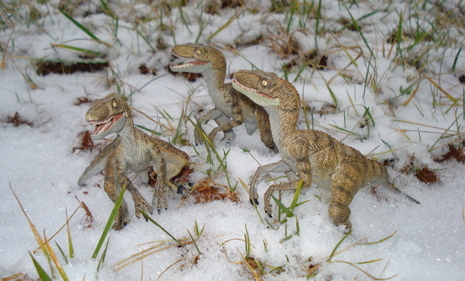 Here's a pair of (X-Plus) Styracosurs digging in the snow for munchies. This can make you stop dreaming of a white Christmas. I'm just dreaming of a green shoot. But there are others out thinking of something to eat, too. You two are a dream come true. We don't get your point. Perhaps you'll get ours?. And so Winter 2012 blunders off into the record books. 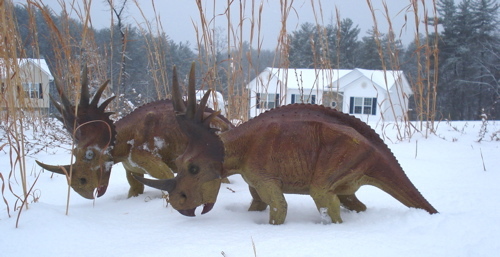 Those Dinosaurs were dreaming of a winter like we just had. Have you been dreaming of your own, profitable website? You can make that dream come true, here. 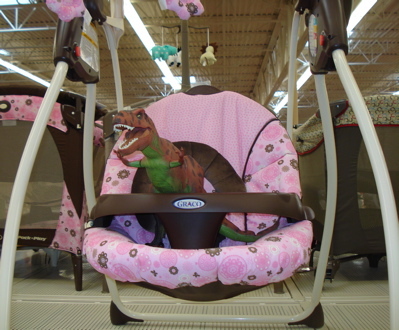 Back when DinoBabe was younger and relatively helpless Rexford thought her to be a potentially tasty little dish. He can be a real cad when it comes to dietary planning. In this case I think he let his natural instincts get a bit out of hand. Her guardian, Snow Leopard, is sleeping on the job and she appears relatively oblivious. Sneaking up on her is even easier than I thought. Wook at me!! I walk on my hanz and neez! I am the world's smartest, bestest hunter ever. Wook at me!! I stanz up on my feets! Gotcha now, you tasty cutie pie. Hewwo mistah Wexfud. My, what big teeefs you haff! OH NO!! I can't watch. Mistah Wexfud, watta big soff nose you haff. Yeah. My arms are too short. If you're hunting for help in creating and running your own profitable website you definitely should scout around here. Back when I was a little kid, growing up in New York City, we had seven (7) count 'em seven TV stations, one part-time (13). Channels 5, 9 (WOR) and 11 (WPIX) all played a lot of old movies. 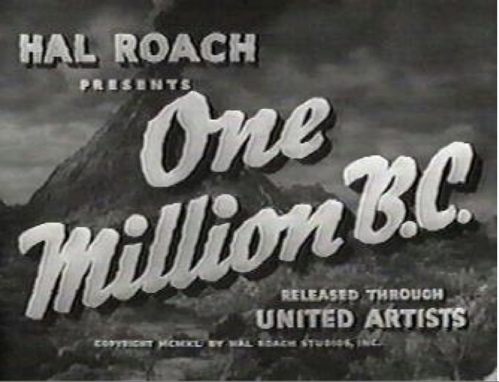 One of my very favorites was Hal Roach's One Million B.C. 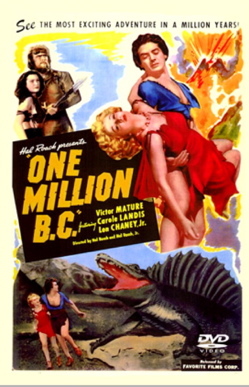 starring Victor Mature. The TV was my movie theater. 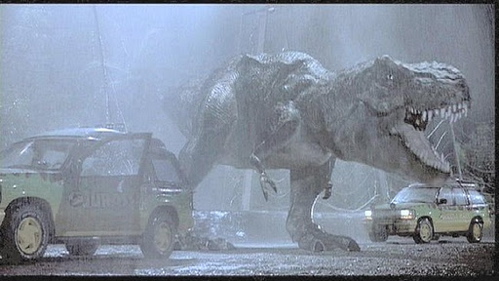 My favorite parts of the movie of course were those that had Dinosaurs involved. 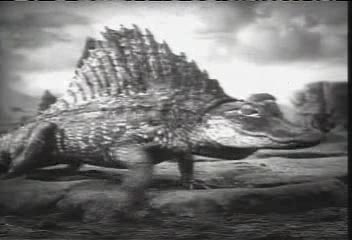 The Dinosaurs weren't the cool special effects creatures we see today but rather character actors. 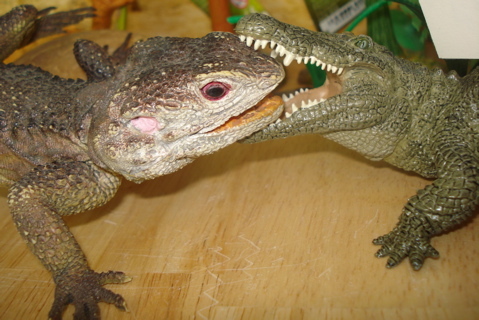 Alligators, horned lizards and monitor lizards with sails, spikes and/or horns glued upon them. 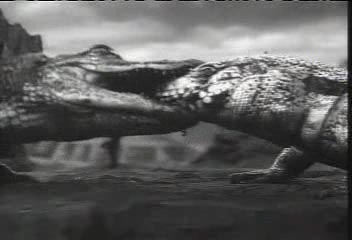 One of the coolest scenes was a battle that took place between an "actorgator" with a "sail' on his back (a la Dimetrodon) versus a Monitor-type lizard. I have chosen to first present the original, and then my colorized remake. 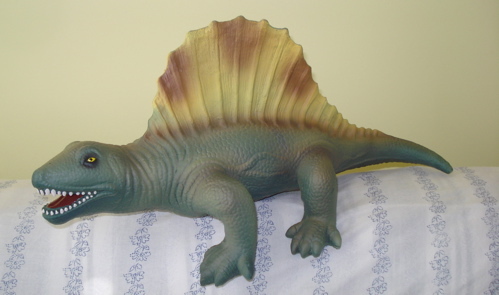 Looks like a Dimetrodon. Yes? 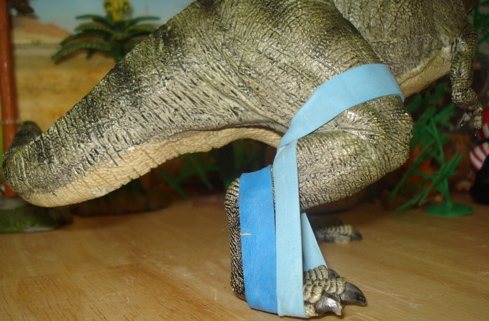 Ooooohhh, I think I sprained my tail. We hope you enjoyed our show. I'd have enjoyed it a lot more if you'd supplied free popcorn. Cheapskate! YOU won't have to remake your profitable website if you check this out. Rexford finally broke down and got some new foot gear today. His reasoning was that leaving those big old three-toed prints all over the place let just anybody know where he has been, get into his business and curtail his hunting style. 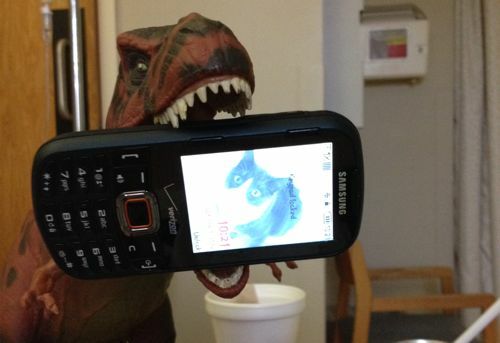 Rexford is BIG on personal privacy. Hey!! Who turned out the lights? This can't be right! 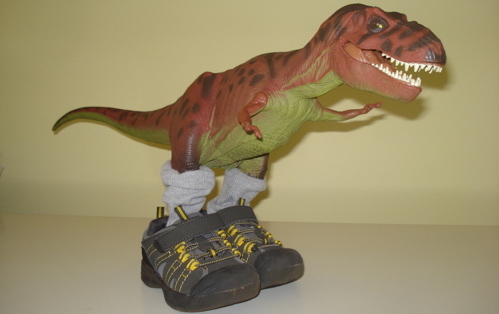 No Rexford, they're boots and they go on your feet. Remember why you got them? Oh. This is much better. Now, for shoes. I even got sox. I'm dressed to kill. He got so excited that he decided to try on everything at once. I mean, if two shoes are good, four must be better. Right? Hey!! Who turned out the lights? This is the same problem I had when I began dressing up. 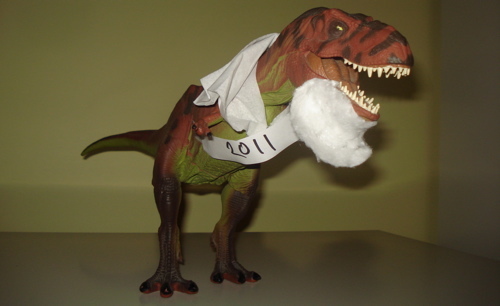 And if you never do laundry, like Rexford, they will, too. I don't think clothing is really in the cards here after all. Funny how "magic" comes up when mentioning 'cards.' You can do magic tricks with cards but you don't need magic when you build your own income producing website. There's no "magic" to creating a profitable web-business, let me show you how it's done by clicking here. A welcome revision although the original Green version will now be going out of production and become a "collectible". for which I am truly on the edge of my seat. But, perhaps, I should be careful what I wish for. Eh? Have you been wishing for your own, profitable website? You can make that wish come true, here. 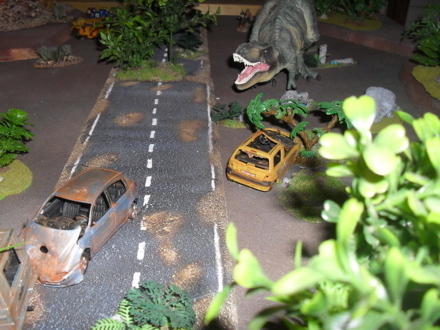 the Safari Ltd Liopleurodon looks almost alive. There is just so much dynamic animation in this sculpt. Once again demonstrating that great things can come in little packages. A few more pictures- a) to show the dynamic movement inherent in the figure sculpt, b) to picture it actively 'on the hunt,' and c) just because I really like this figure. All in all a highly recommended figure for any collection. If it has a fault at all (which it doesn't) it is in its small size. 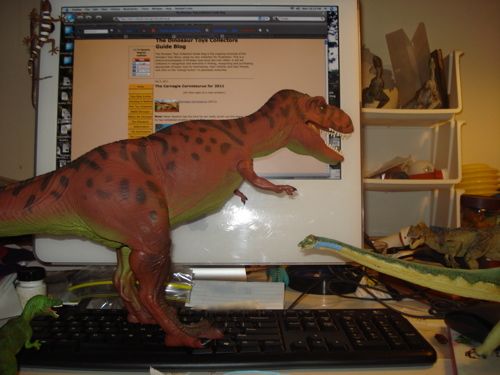 Rexford particularly likes this figure. See why people really love SBI. YOUR Web Business solution. 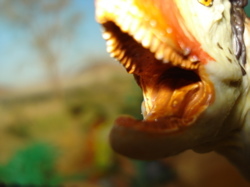 You may have noticed the void on this site when it comes to nautical Dinosaurs or "Pre-evolutionary-Chickens-of-the-Sea." This is simply because I don't have photoshop and can't figure out a good way to do an underwater page. I have the same problem with the flyers as well. 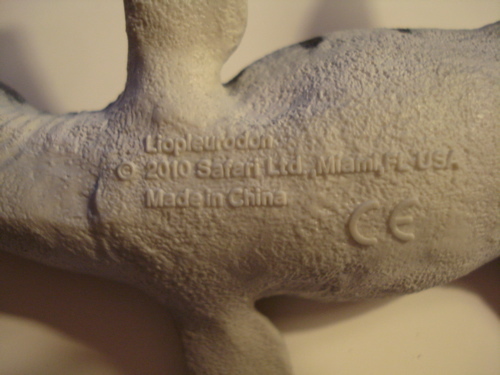 That said I really, really like the Safari Ltd 2010 Liopleurodon. Yes, it's small (~7"). But oh my gosh... what they have packed into those seven inches! From nose to tail this little flippered fellow is one fine figure of a sea-serpent. 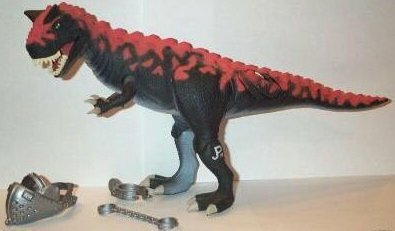 As can be seen in the accompanying photos the details... from the beady red eyes all the way to the very fine pebbling of the skin and the truly excellent paint-job make this figure's chassis quite a classy one to, if not envy, certainly enjoy. This very-fine 'graininess' is carried throughout the entire figure while folds of skin, as seen on the left (inner curve) side of the neck simply add to the realism while highlighting the figure's detail. That detail is found not merely in the coloring, and the 'skin' texture but seen in the muscularity and, particularly, in the boney character of the skull. The head itself, as shown below, is highly detailed with exceptional attention payed to the teeth, which certainly deserve, even demand, said attention. 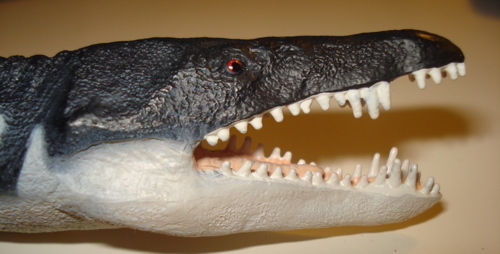 When observed from above the narrow, arrow-like head truly focuses the predatory nature of the Liopleurodon, and the eyes... their binocular vision providing a clearly unobstructed forward view. 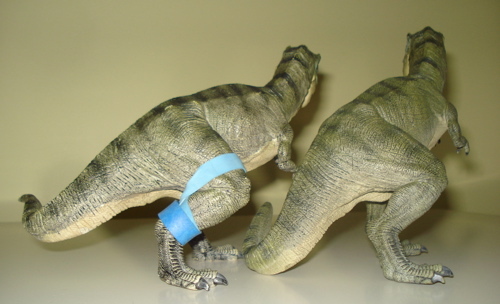 You may have noticed that one of these Papo T-Rex has some blue rubber bands on its right leg. Quite astute. Those bands are the ones I used to get him to stand on his own two legs, without the help of the tail, and he does so, so very well. 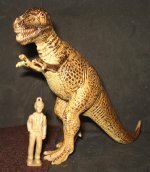 This blog (which will eventually be a part of the Papo T-Rex page) will essentially be a set of photo-comps of the original Tyrannosaurus with the "modified" model. 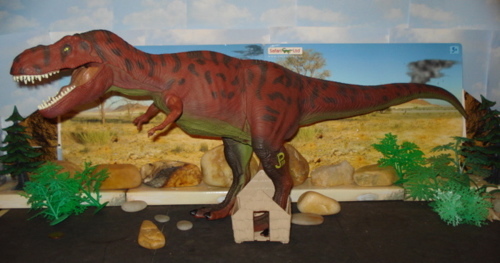 One of the new 2012 Papo Rexs will be a repaint of this one, in a brown motif. 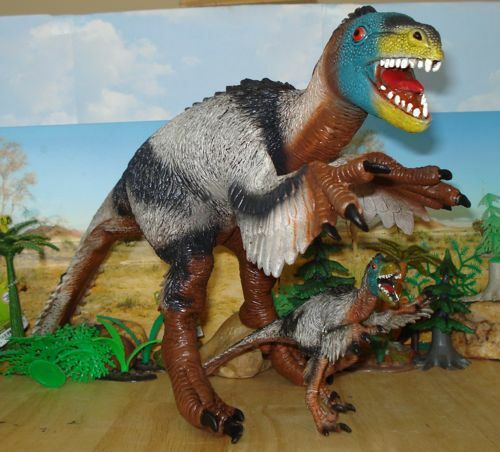 As you can see below, the modified Rex stands quite "naturally" on its two legs as compared to the original. 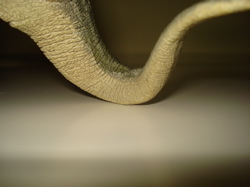 On the left is the original tail position, on the right the modified. But the real question is does this modification make a noticeable difference in the figure's posture? I think it does. 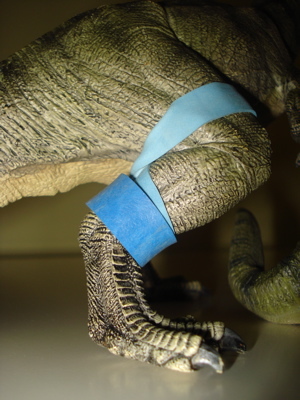 The blue bands provide ready identification of the Modified-Rex. 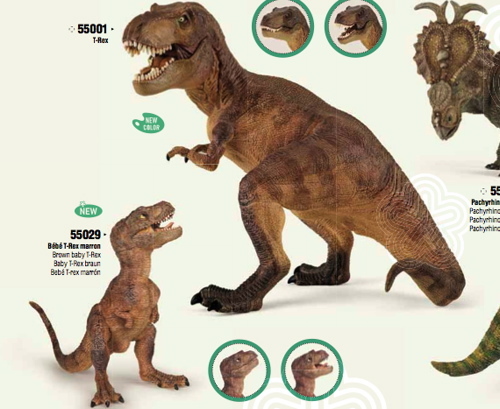 From some angles it doesn't seem to make much of a difference and becomes more of a personal aesthetic, I personally prefer Rexy on just two feet. 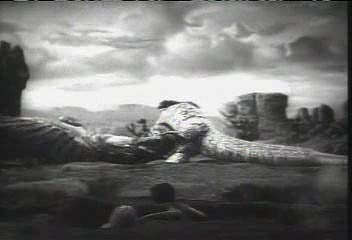 Objectively though being up off its tail does seem to lend more movement to the 'creature,' more animation perhaps. What do you think? To me the three point stance often leaves the figure looking as if it is off-balance, back-on-its-heels; while the modified figure is in a more action-oriented and aggressive stance. You won't have any problems modifying your new Home Page when you go with SBI. 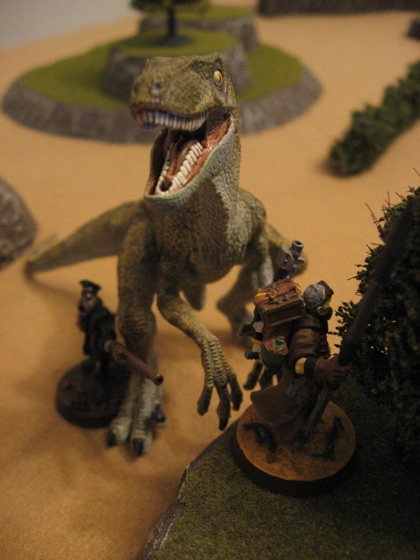 With the upcoming new Papo T-Rex I'm reviewing the original in the blog. on a shelf in my local toy store/gift shoppe. 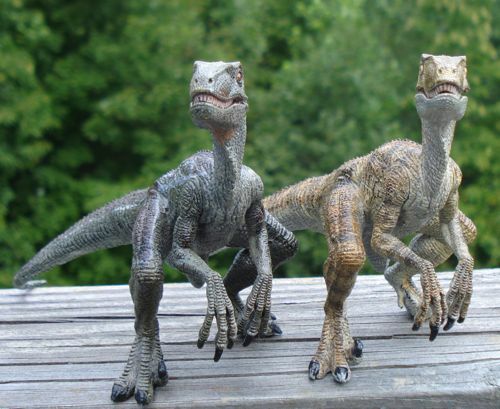 There were in fact two (along with two raptors, but they're another story) and I instantaneously coveted them. Luckily for me and unluckily for my finances I had my debit-card with me and within minutes all four were mine...bwa ha ha. 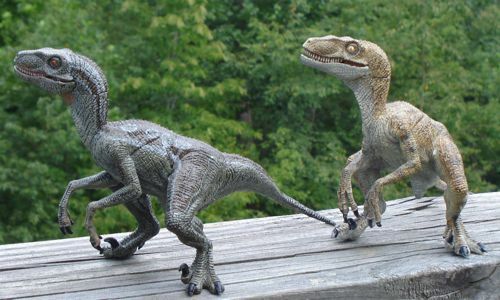 This Papo T-Rex was and is the most realistic looking Tyrannosaurus toy figure available from anybody at an affordable price. 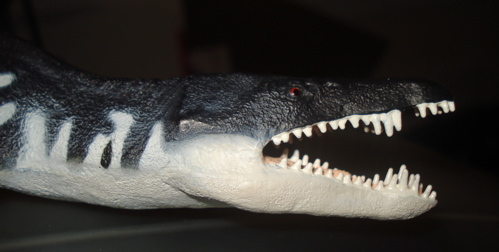 It even has an adjustable lower jaw (opens and closes) for a great variety of expressions. 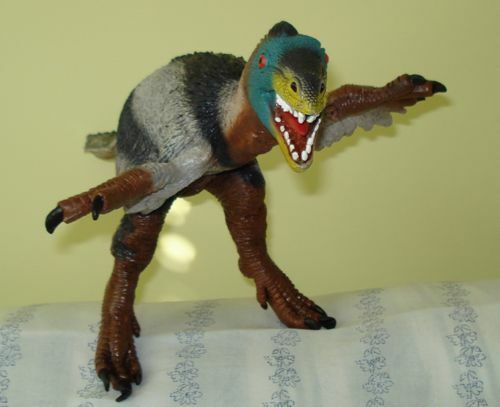 The major flaw is that by 2005 (when this was released) most toy manufacturers (SafariLtd, Bullyland, Schleich et al) had licked the balance problem and posed their Theropods on two legs. This Rex was balanced on its tail. The infamous Three-legged-stool-Rex; what to do, what to do. I had found previous answers using a hot water bath but this guy was ever so easy to bend I decided to try simple rubber bands. I used bands from Broccoli my wife purchased at our local food market. The balance on the figure is excellent. All it needed was a bit of a push, or squeeze, in the right direction. That direction was simply pulling the right foot up, towards the right knee (you can see the bands in case they are needed again), overnight. More on this figure coming soon. 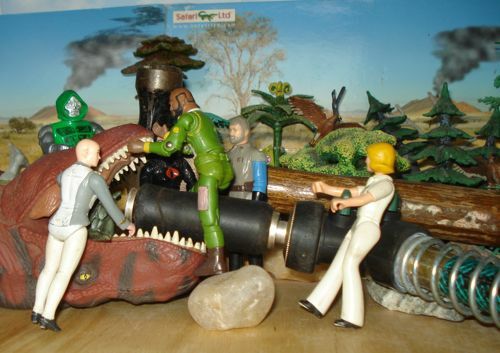 One thing in the Dinosaur Toys world we can count on today are fabulous new figures from Safari Ltd coming out each new year. 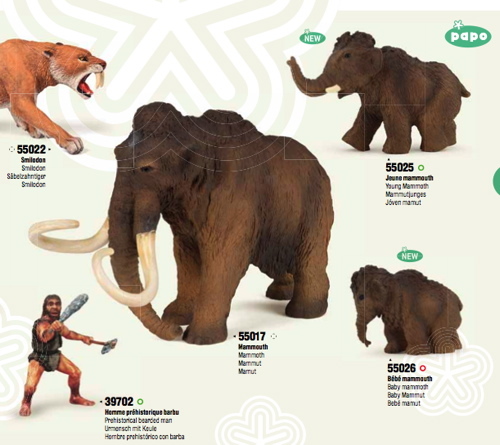 Our Happy New Year will be extended by these new figures in the Carnegie Collection and Wild Safari lineups. 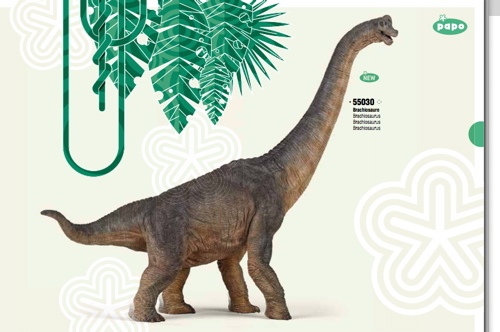 Maybe next year we'll get a new Carnegie Apatosaurus. 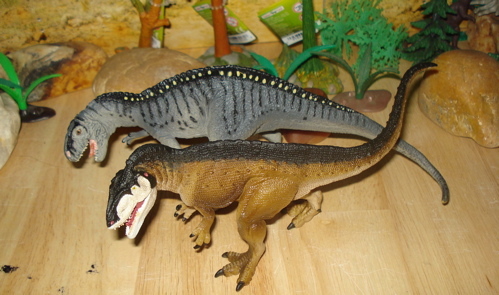 In the world of Wild Safari figures these have gone from their late 90's toy-like appearance (even then they were among the best Dinosaur figures) to being the best line of Dinosaur Toys (IMHO) available today. I decry that they are not in constant scale. If only. 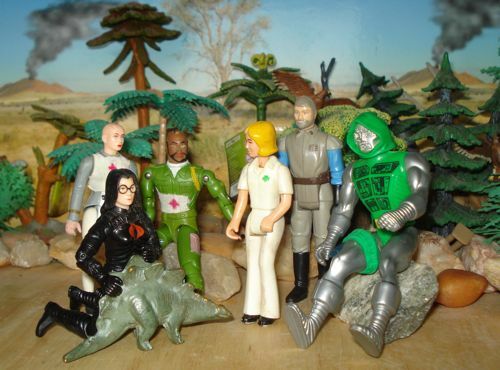 We have four new figures, two replacement figures and two utterly new. 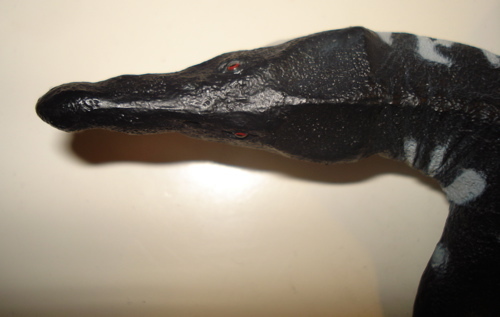 figure that should prove to be the Acrocanthosaur-to-beat for the next several years. 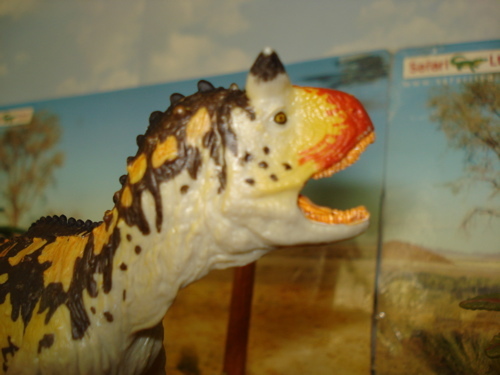 This new Ceratosaurus looks like it will rool its roost for years to come. 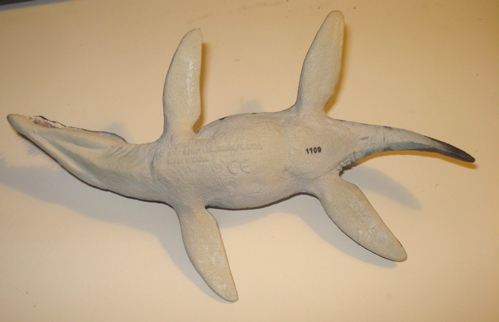 about 20 feet long in real life, and brought to you within two years of its determination as a unique species. These five new offerings from Safari Ltd should all prove Happy additions to your collection in the New Year. You better get 'em before I eat 'em all up. 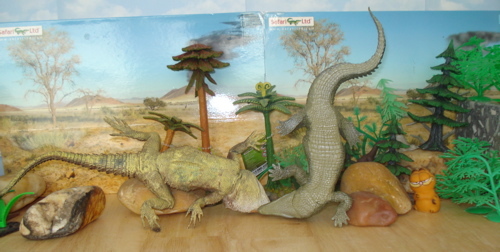 You can compare Safari Ltd figures to their competitors by holding them in your hands. COMPARE web-business sites here! 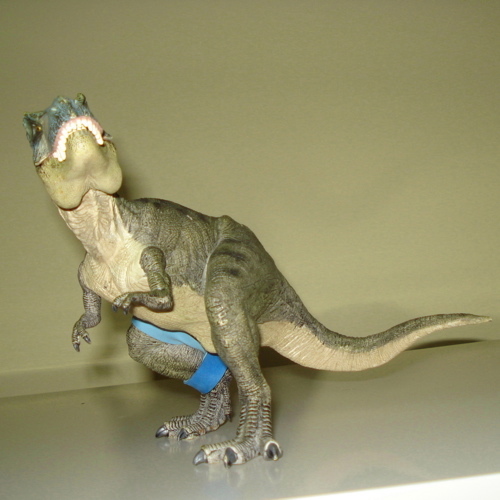 The first time I came across a Papo figure it was in 2006 in a small gift shop and it was their T-Rex. I was amazed. 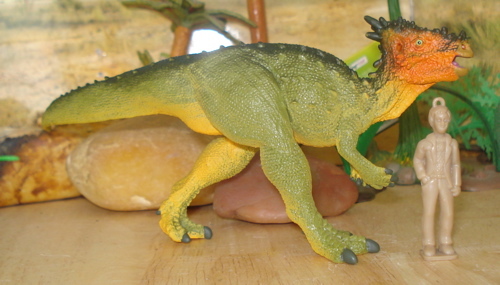 Having collected Dinosaur Toys for over fifty years I was used to continuing improvements in detail and realism but this was a quantum leap forward. 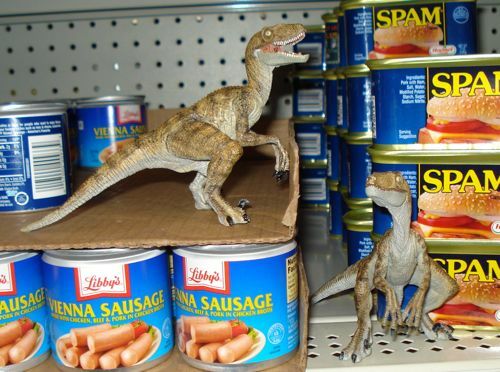 It was obviously based on the original Jurassic Park movie and was accompanied on the shelf by a Raptor, also JP based. 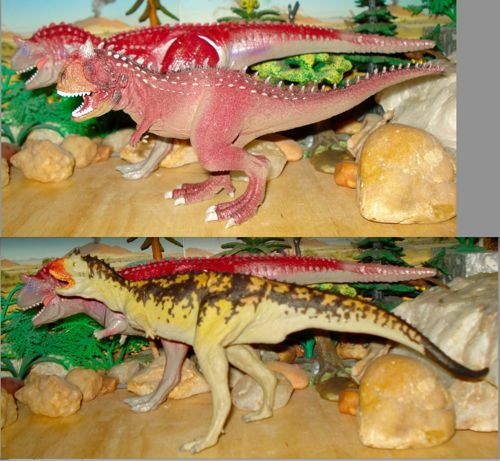 Apart from excruciating detail the figures sport a PAPO original- the movable lower jaw found on all their carnivores (see the Spinosaurus and Allosaurus). 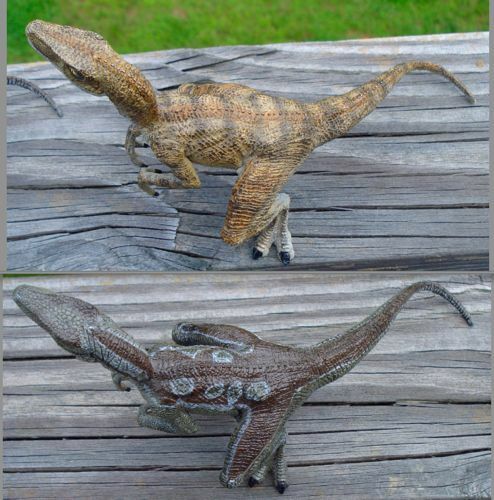 These figures are truly "Museum Quality" in appearance if not paleontologic accuracy. But heck, they're toys!! 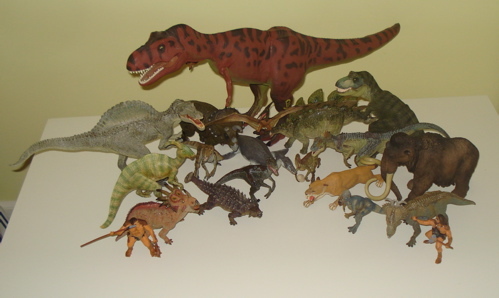 Below is a picture of the complete 2011 Papo Dinosaur/Prehistoric lineup (less paleolitic fire-pit). Papo is coming up with some fabulous new pieces to combine with those already presented. 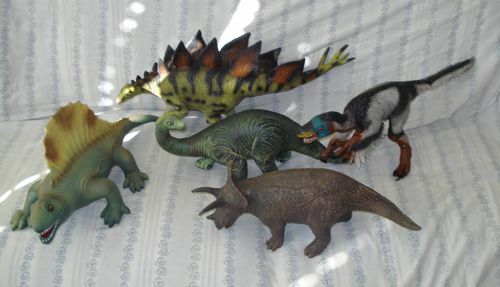 I have done pages on several of these (Stegosaurus, Triceratops and Parasaurolophus among others) but held off on the Rex and Raptor pages, largely because I have not been sure I'd do them justice. 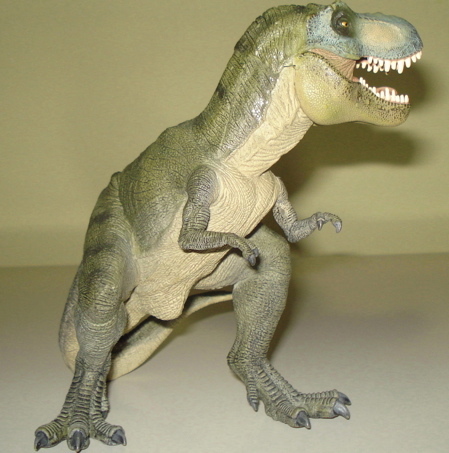 Additionally, the pose of the T-Rex is a tad uninspired. So much for perfection. 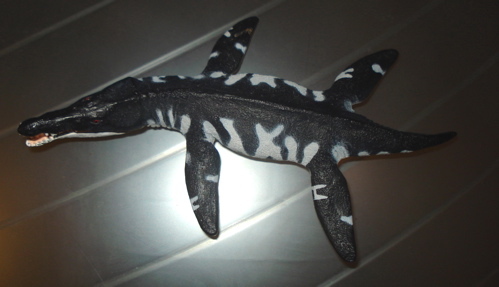 And a Tylosaur to join the Plesiosaurus introduced last year. But that's not all. Not even close. Read on to part 2. 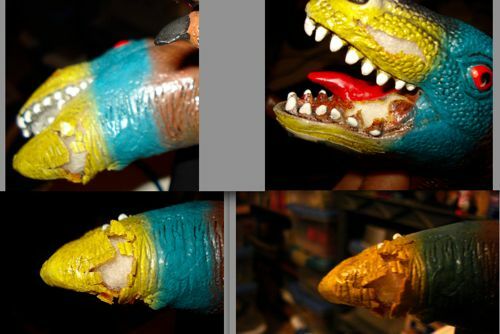 The current green T-Rex will be replaced by a 'new' (read- repaint) brown T-Rex of the same mold. 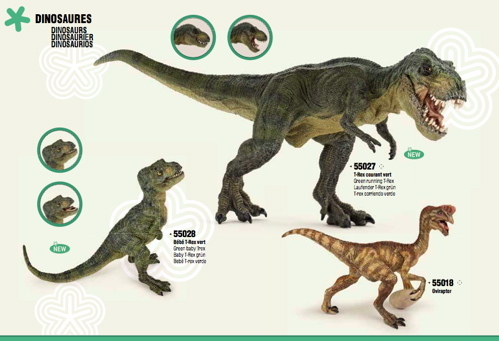 And if you wonder where the brown T-Rex came from there is a brown baby (with the 'action jaw') also arriving for 2012.
coming onto the scene. Given Papo's history of realism and detail it looks just about perfect. (It, too, comes with a little green bun fresh out of the oven. Well, it doesn't actually come with one, they are sold separately.) And it is already threatening its smaller stablemates. Hello there tasty little snack-fella. The least you could do is wait until you're released to eat me. 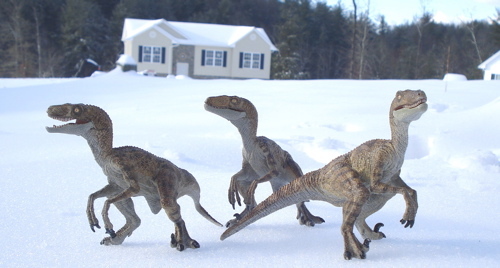 Rexford is coming, too, and finds the Papo figures to be quite nice and really likes them. I'll take one from column 'A', two from column 'B'... aw heck, I'll take 'em all. Except for those bitey looking ones. If Rexford likes 'em, they've got to be good. And I like YOU, too. Do YOU have a small business? Do you want to start one? Find out HERE how you can start your own, profitable web-business or grow the one you already have. That wasn't all that bad, was it Dad? No. 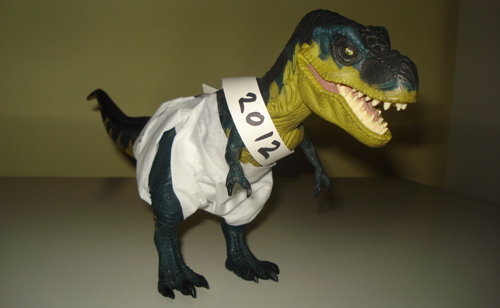 And we've got a lot to look forward to in 2012.
and Papo is too. This is gonna be quite an exciting year all around. I still wanna bite that guy who laughed at me though. 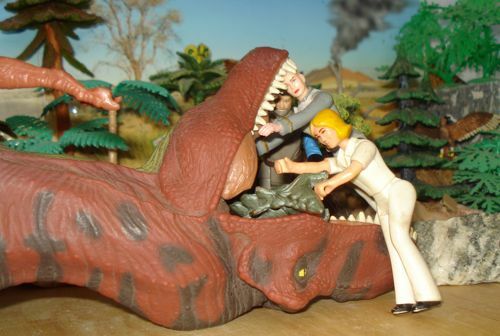 We always want to bite somebody, we're Tyrannosaurs. And we've got the Papo preview coming up tomorrow, in two parts. That'll be really cool. If this sounded a bit like a commercial we apologize, but we do want to thank Safari Ltd, Hotaling Inc (Papo distributor, USA) and Bullyland for their generous support over the past two years. And a very special thanks to SBI, who provides not only our server but invaluable expertise in creating, building and maintaining our website. For the best in Web-Business support, checkout S.B.I. Can I take this stupid sash off now? Yes. But save it, I'll need it next year. 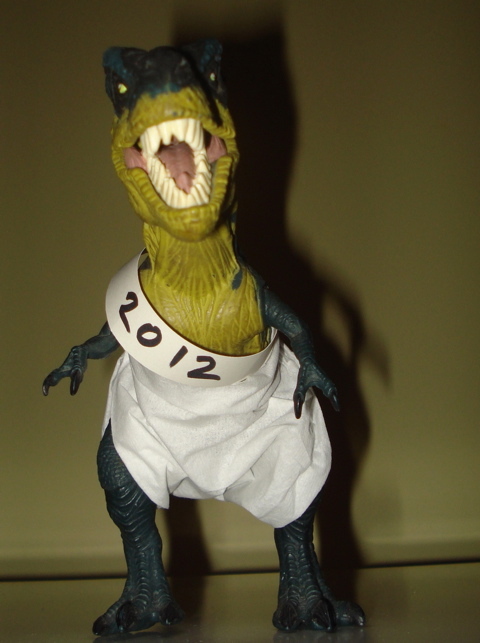 And tomorrow we re-present our two part PAPO 2012 debut, same Dinotime, same Dinochannel. Once again, I'm humiliated. 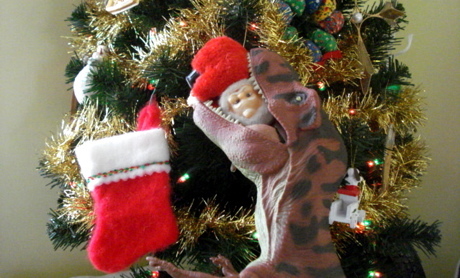 Every year for 65 million years this happens. Next year I'm going to Barbados right after Christmas. I don't like this outfit. I feel ridiculous. This is worse than Dads. Can anyone see me in this? Looks to me like we're heading out of a tough year and into one with an awful lot of attitude. Just keep your attitude one of gratitude. 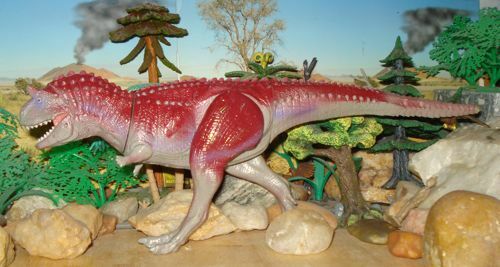 We here at The Dinosaur Toys Collectors Guide want to thank our web provider, SBI, for all they have done to make our site a success. In the short period of two years we have worked our way into the top 1% of all web sites, worldwide, with nearly 1000 page visits per day. Would YOU like to have your own successful website? You can COMPARE Web Business services here! or Take Alexa traffic test, here. So whether you have a local brick and mortar business and want to create a site dedicated to what you do and what you have to offer- Click here to find out how SBI can help. or if it's simply a dream of having your own, profitable website? You can make that dream come true, here. So for the New Year give yourself that successful website you've always wanted. Click here to learn how to build it. why there was no Christmas blog. Or why you didn't get everything you wanted on your Christmas list. 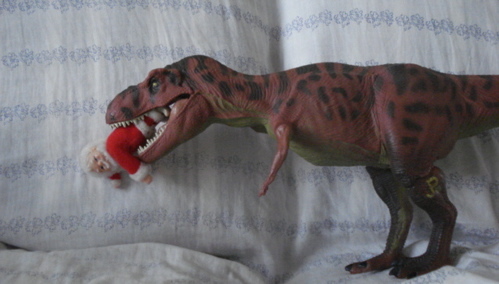 Or just what may have happened to good old Santa Claus this year. 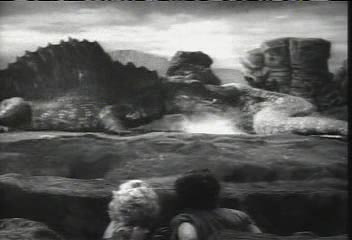 Well, just as there was no joy in Mudville after Mighty Casey struck out there was no joy in Dinotown after mighty Rexford simply struck. 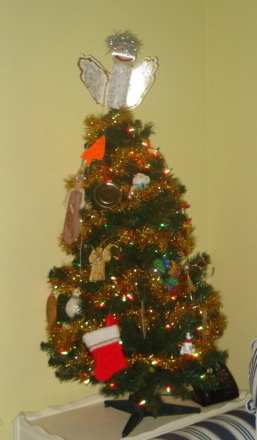 I finally caught that mouse that's been eating the popcorn off our tree!! Ho, ho, uh oh, no, no, HELP!! As soon as we flipped on the lights we realized a minor mis-steak had occurred. Good grief! I was only reaching for the cookies and milk. 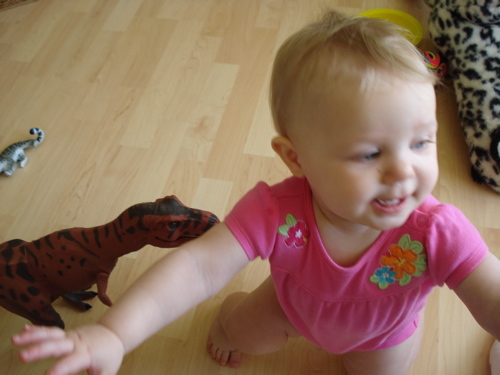 First I would like to make it clear that there was no intent to deprive good little boys and girls of Dinosaur toys. It was dark and Santa was just scurrying around the tree and there had been this annoying mouse recently and I just chomped down, if you know what I mean. I coughed the old elf right up and besides, he didn't taste very good anyway and he was a lot tougher than that jolly, fat countenance suggests. This interview is over! Dinosaurs... Cowboys; What's Not to Like? 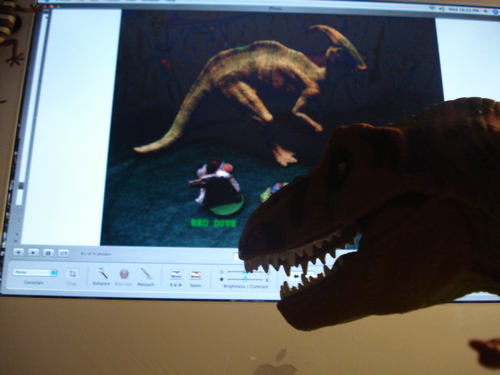 Rexford recently received a ConactOsaurus message from a fan regarding an action game he has devised. Rexford sees high potential in cleaning up the battlefield after each encounter and thought to pass the information on. 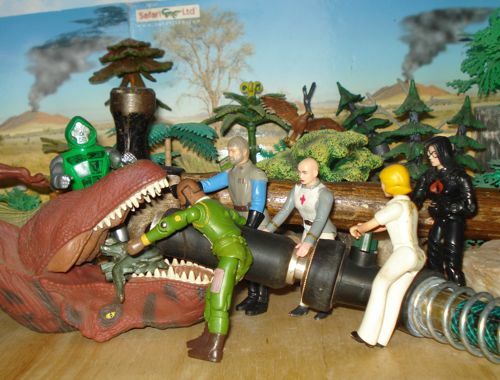 It looks like fun so here is what it is called and where you can find it: Dinosaur Cowboys- Yahoo!! 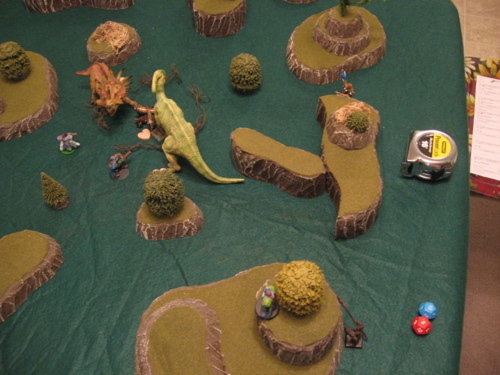 "Dinosaur Cowboys is a fast playing (30-60 minutes) tabletop skirmish game of competing "posses" composed of up to 5 members and 1 dinosaur. Each character in the posse can be customized to fulfill a different role and purchase weapons and equipment from the many options available. Combat takes place in the futuristic landscape of the year 2285, where a supervolcano erupted and changed the course of mankind forever. 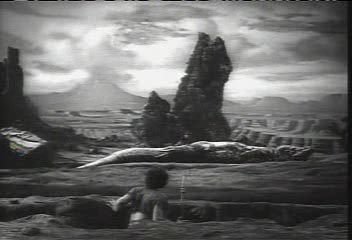 Procon T-Rex surveys the ruins. In general the game is built around twelve sided dice and is meant to be light, thematic, fast playing (and bloody in a non-staining sorta way! ed.). 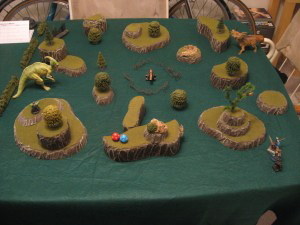 Players build a Posse containing 28mm figures representing a Leader, 2-4 Members, and up to 1 Dinosaur (Papo is a popular choice for these, Wild Safari, Carnegie, Bullyland and others are under consideration. Your posse, your choice. ed.) Different statistics (Movement, Hitpoints, etc.) are used to resolve actions on the table and can be customized by spending Improvement Points to really help differentiate Posses. Weapons and equipment are purchased from a list of over 75 items ranging from laser Six-Shooters to plasma Shotguns. 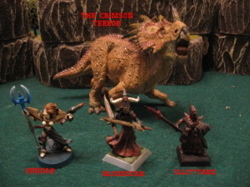 Posses battle each other in one-off stand alone games or in linked campaigns where they can build and grow their gang." All in all "Dinosaur Cowboys" looks like a great game to play and an interesting way to keep your carnivorous Dinosaurs from thinking too much about you. And an entertaining way to get others to do your hunting for you. Mmmmmmmmmm, tasty. This site has clawed it's way into the top 1% of all websites worldwide in less than two years. A simple one-man, one Rexford operation. How'd we do that? Take the "Alexa traffic test" and find out. 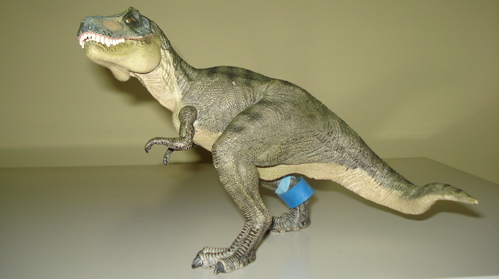 This link will access the new 2011 Carnegie Carnotaurus page. 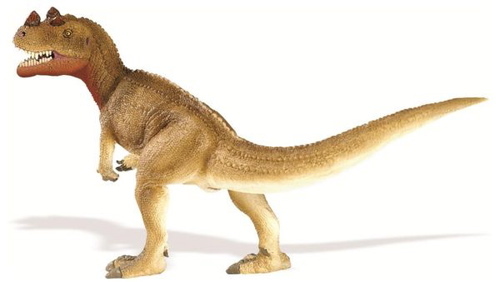 The Carnotaurus was a 26 foot long 2-ton South American Apex predator of the late Cretaceous period. So named ("meat eating bull") for the two horn-like protuberances on his skull. This is a real departure from the traditional and creates a very realistic "lean and hungry look," as well as a rather scary visage. I really like this figure based on what appears to me to be its high level of "realism" given the excellent detail of the sculpture itself (beautiful skin texture with natural looking folds) as well as the beautiful paint job (how do they do it?). 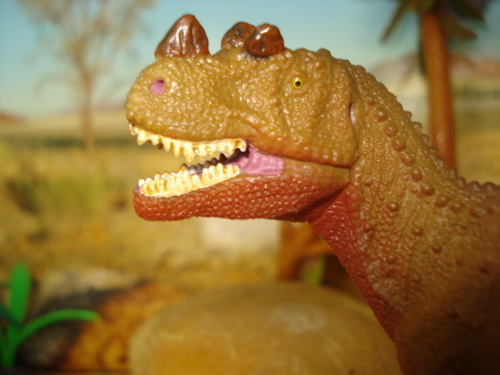 WE usually poo-poo the concept of realism in Dinosaur toys. After all, who the heck knows from real when no one has ever seen these. All we have is conjecture as to how they looked. 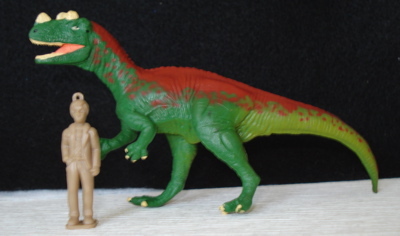 But the recent figures, the past half-decade or so, have seen a quantum jump in the appearance, the "realism" if you will, of the Safari Ltd/Carnegie Collection Dinosaur figures. This one is the best so far and sets a new and higher standard for those to come. And it ain't easy typing with your feet, either.